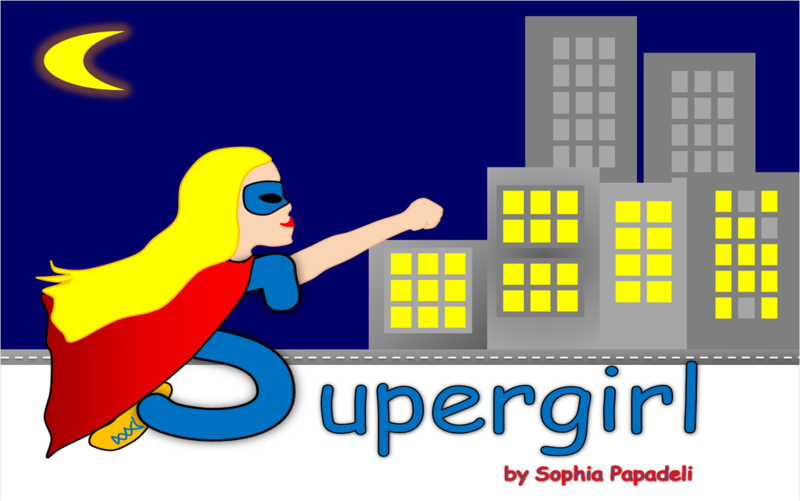 S is for Sophie, the Supergirl ! 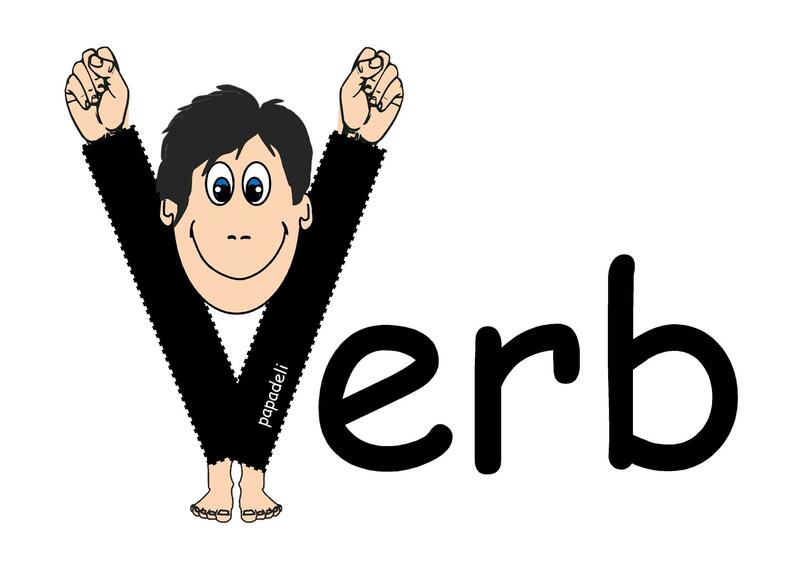 How many times have we tried to explain what a verb is? Is it necessary to teach the rules to our learners? How long does it take to make them understand the word order? Wouldn’t it be better to create beautiful stories through which grammar would be more comprehensible? Let me introduce you to Victor, the Verb: He likes doing things. He never gets tired. He’s a doer! He likes hanging around with others but he needs his friends to be arranged in a certain way. He usually spends time with Sam, the Subject. Victor the Verb is very polite. He lets Sam stand first in the queue. Victor sometimes invites Olga the Object. Here’s their selfie: 1. Sam the Subject 2. Victor the Verb 3. Olga the Object In this case, this is what they say: ‘Sam loves Olga.” Loves? Why loves and not love? Here’s one of my stories I usually tell my students in order to attract their attention and help their memory. Victor the Verb is a doer, as I said. But when Victor meets “he”, “she”, “it”, he gets tired. He doesn’t like being with them without help. Look at his face. He doesn’t agree. He’s furious! Victor the Verb: “I can’t deal with them on my own! I need help! Supergirl! Where are you?” Wow! There she is! Strong and beautiful, always a helper! 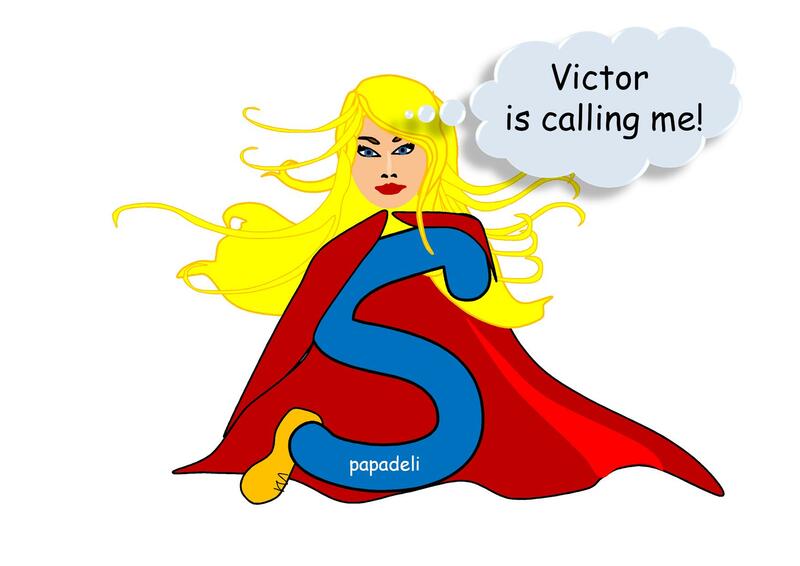 Whenever Victor the Verb needs her, she flies right away and gives him a hand. What a girl! Look at Victor when she arrives. He’s peaceful and happy. He can ample time with he, she, it, as long as she is there, next to him! Everybody is OK now! There is an agreement. They can have a good time together. No arguments, no quarrels. Supergirl is the one who fixes all problems. Want to see another example? Victor can do everything with anyone as long as Supergirl stands next to him when “he, she, it” are around. Let’s watch him getting transformed into “agree”… Look at Supergirl now. She gets Sam the Subject and Victor the Verb to agree. Eventually, we have a subject-verb agreement! But who is Supergirl? I’m not going to tell you much. I’ll reveal her name: Sophie, because S stands for Sophie, the wise girl. She uses her super powers to save people from bad guys. 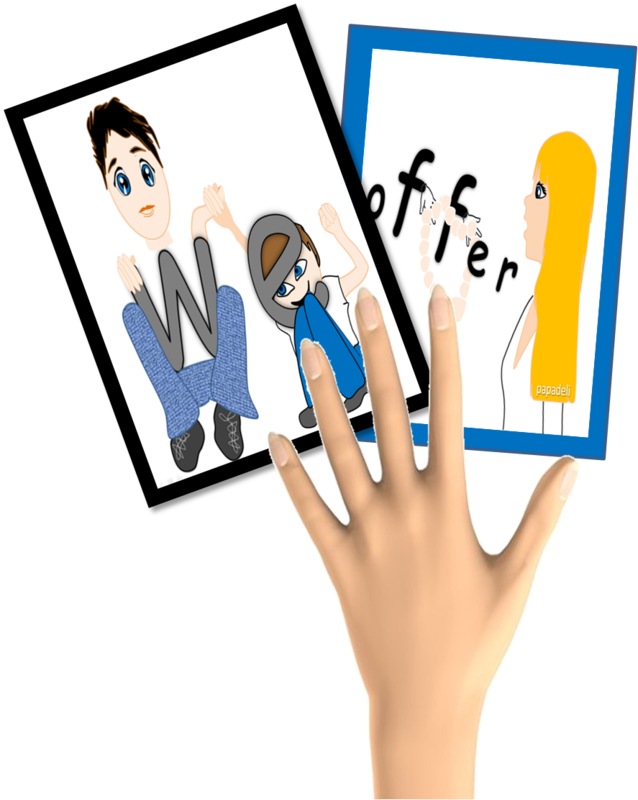 She helps Victor the Verb come to an agreement and avoid huge misunderstandings. She is the main character of my vocabulary and grammar stories. 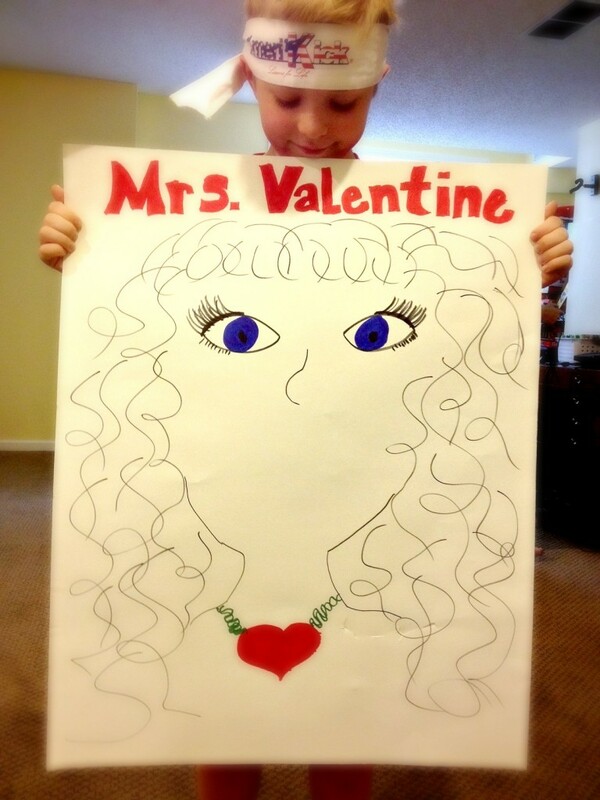 My kids adore her! 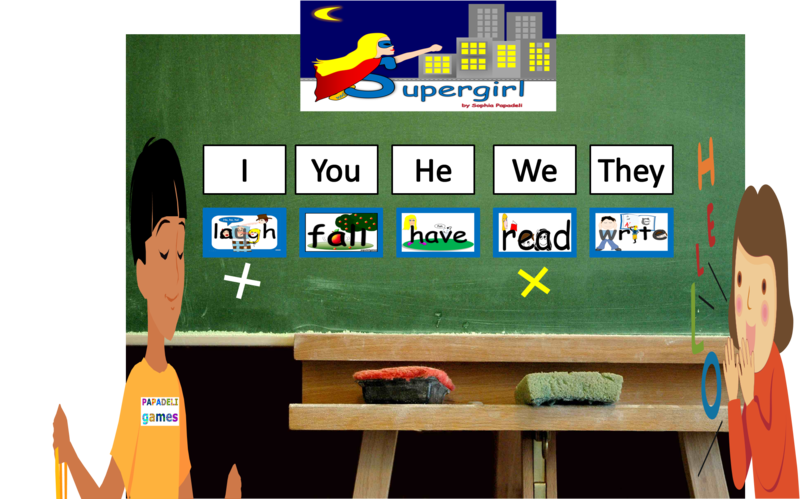 How can you practise Simple Present with Sophie the Supergirl? 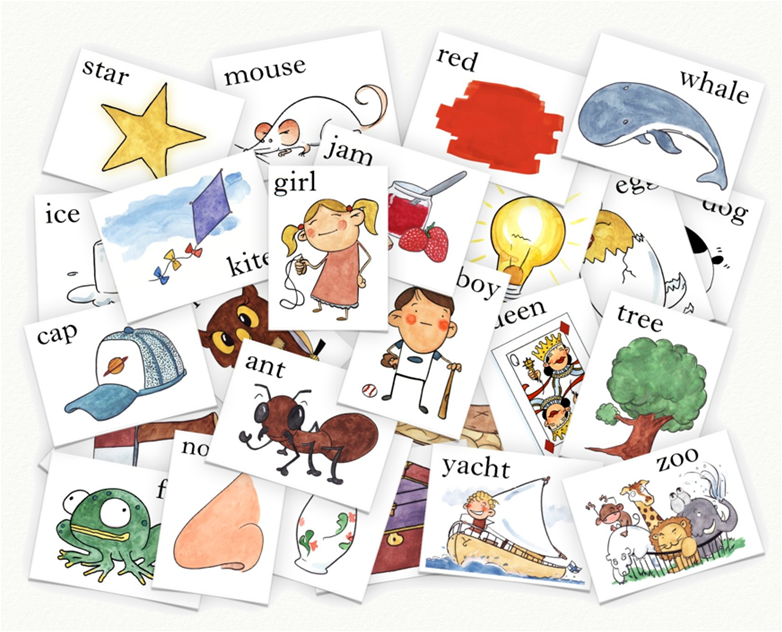 Have two piles of cards: The first one with subjects and the second with verbs. Glue your subject cards on black cardboard and you verbs on blue. For my classes, Simple Present is blue. Ask your learners to form a sentence. 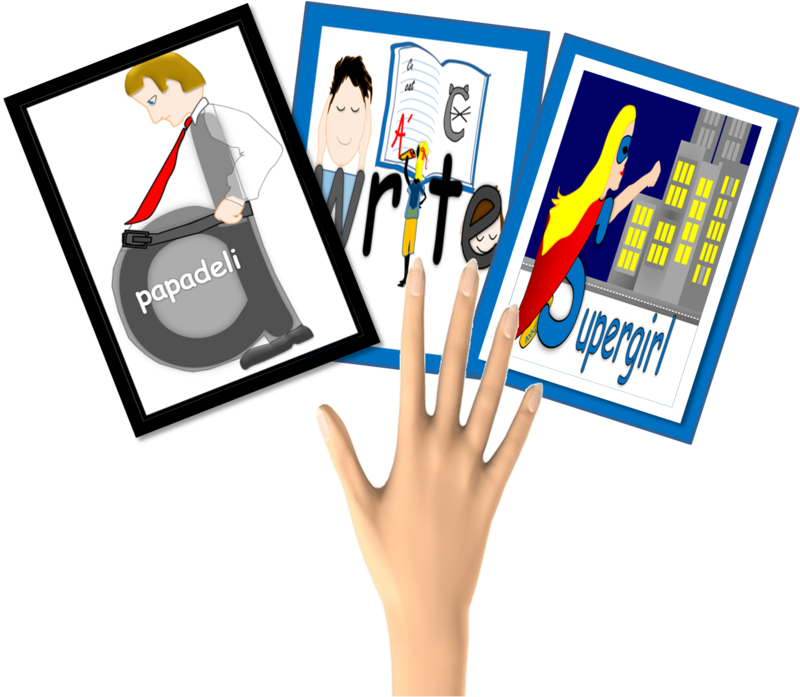 Have a card of Supergirl in case Victor the Verb needs her to make an agreement with Sam the Subject. 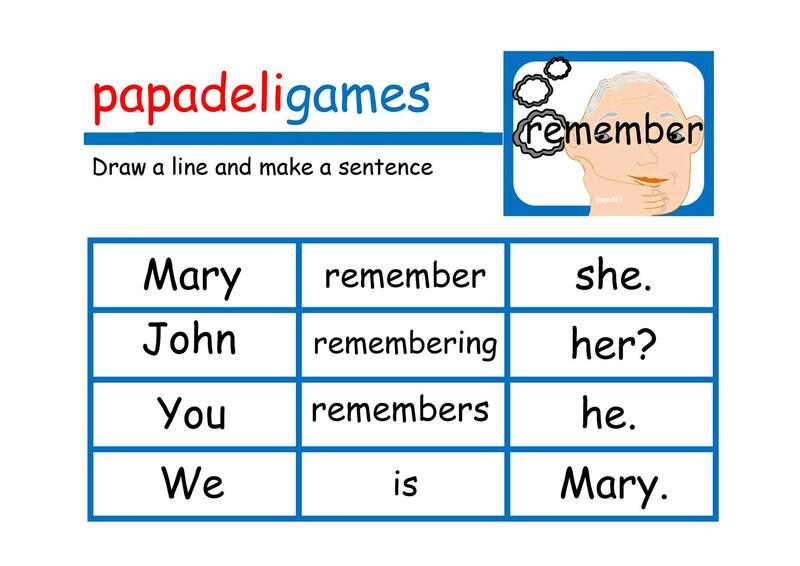 The student can keep the cards if he/she can form a sentence correctly. In case he/she makes a mistake, the student has to put the cards back. Make sure you have as many cards as you can. Try to use the vocabulary they already know so as to consolidate previous knowledge and help them feel confident enough to produce sentences without hesitating about the pronunciation and meaning of the words. Repeat as many times as necessary. You can always use a stopwatch to stop the game. The student who collects the most cards is the winner. If you have large groups and still want to use this game, there is an easy way. All you need is a board -or even a wall- and your piles of subjects and verbs. 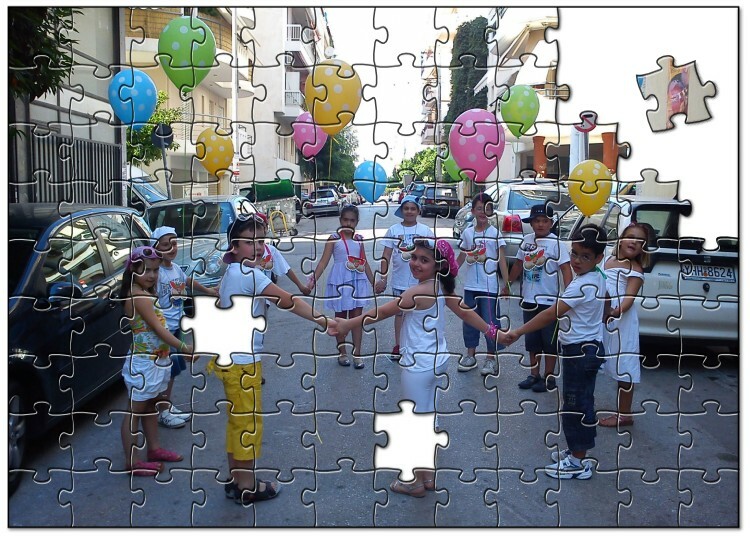 Divide you group in two teams. They have to say a sentence in turns. If they form the sentence correctly, they can move. If they make a mistake, they lose their turn and their opponent plays twice. Team A starts from the left and team B from the right. The winner is the one who reaches the end of the line first. What about some worksheets? Different ones, like my flashcards. You create a grid with 3 columns. Subjects, verbs and objects. 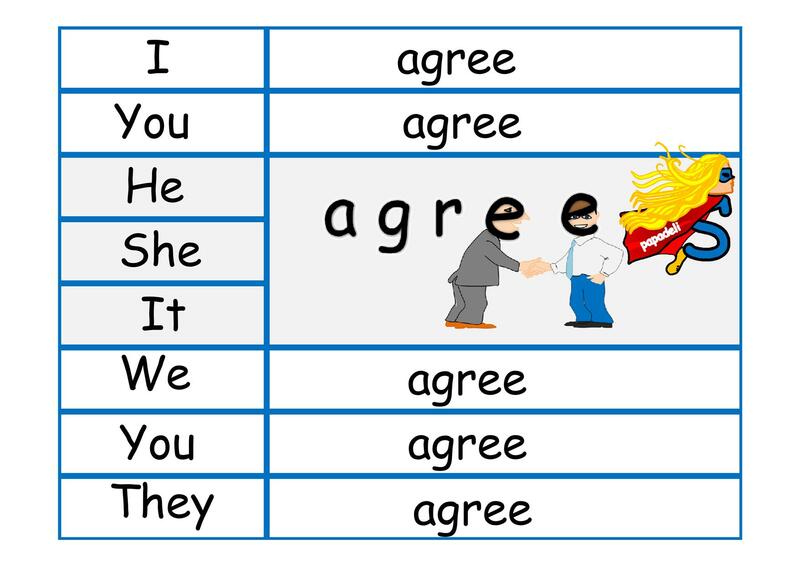 They have to circle one word from each column, connect the three words and make a sentence. They like it because it’s easy and they don’t have to write much. You can use it as a game to make it more interesting. Give your students 5-6 grids each. 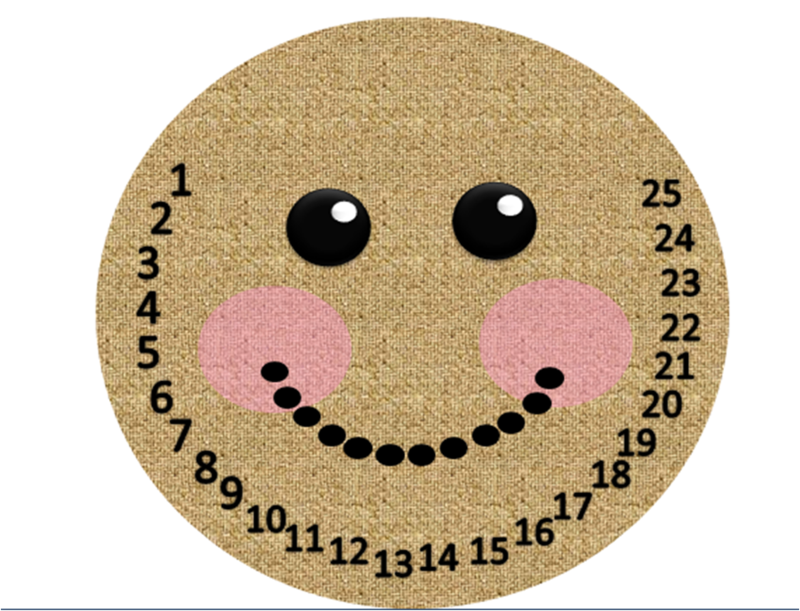 Ask them to circle the answers and set the stopwatch. The one who has the fewest mistakes is the winner. 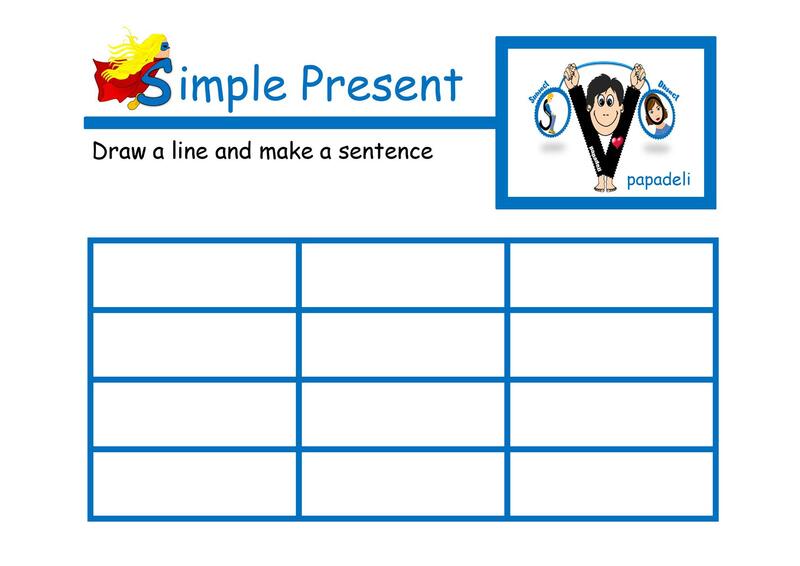 You can print the blank worksheet, fill it in with your words and create your own game. You can even ask your students to complete it and give it to a fellow student to find the answer! What about some homework? Fill in the words according to your needs after printing it. Simple photocopies can give you multiple worksheets. The problem with the photocopies is that you miss the colours. In this case, I think colours are really important because I use blue for Simple Present. I believe that whenever they see a verb in blue, they understand the use of the tense. 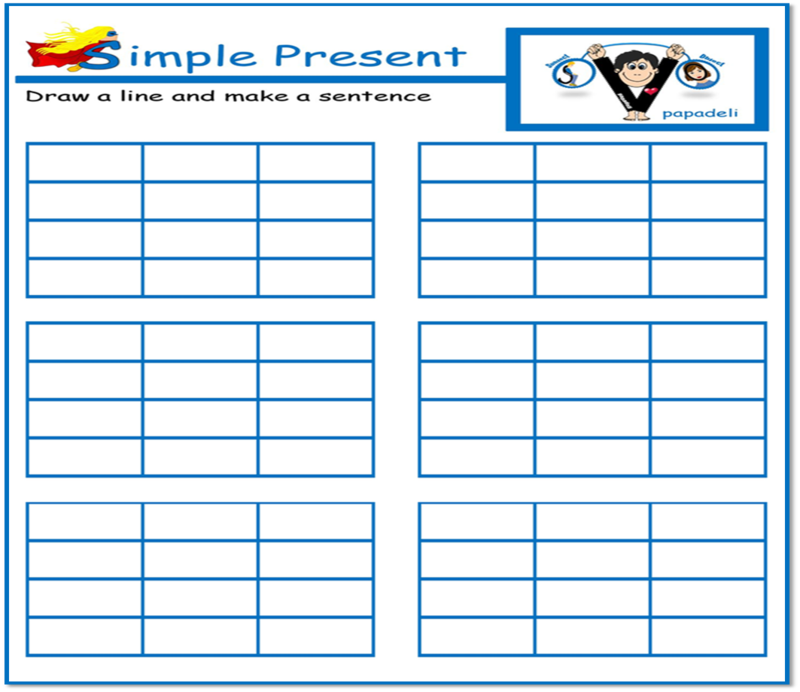 I hope you find my Simple Present tips and tricks useful. If you do find them useful, be sure to follow me on Facebook , English Tricks 4U, Pinterest or Scoopit and sign up for emails to keep up with all the latest ideas. You might also enjoy some of my posts on my personal page on FB. 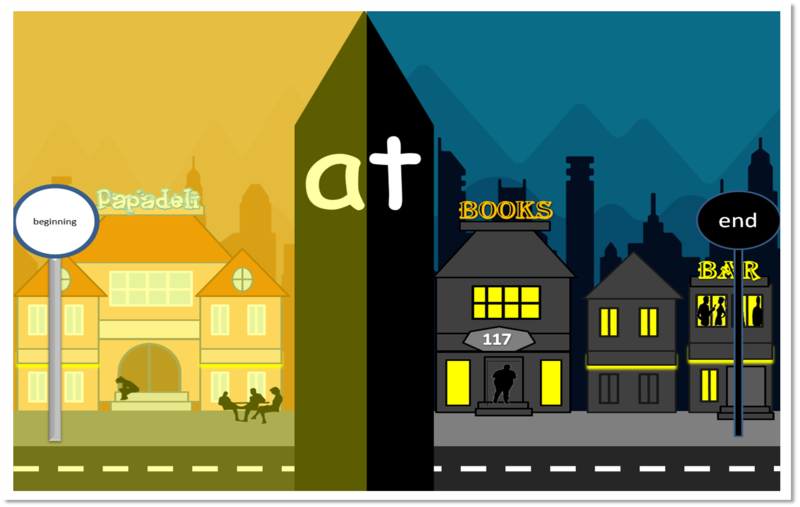 In one picture, we can see all uses of the preposition “at”. 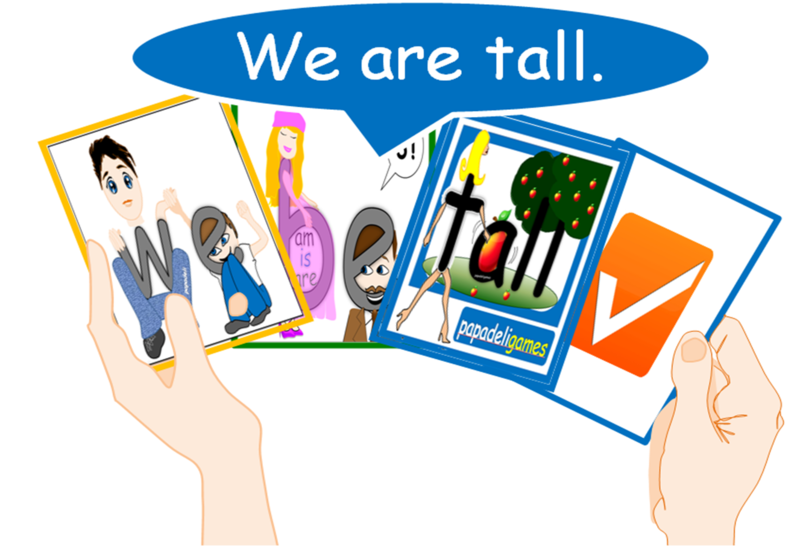 We can present the picture to the learner either as a story or as a simple flashcard. 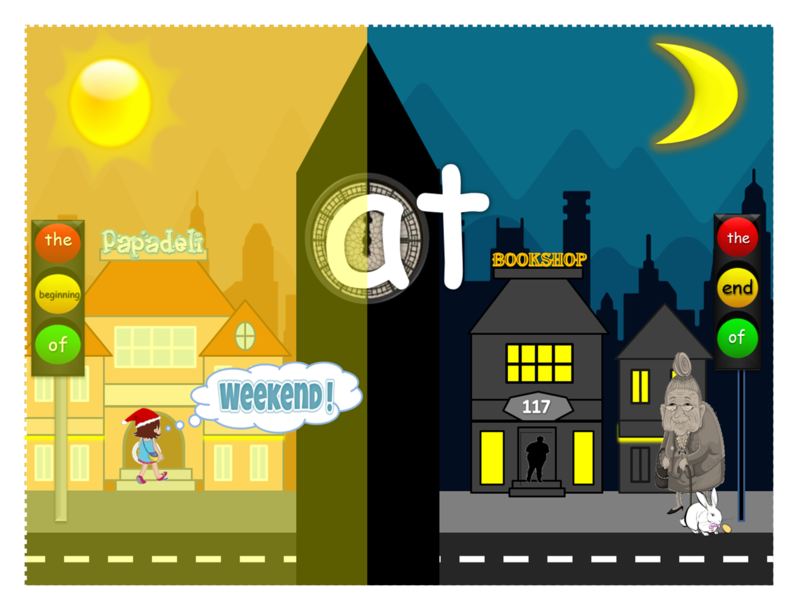 The one on the left, where things are happening during the day. 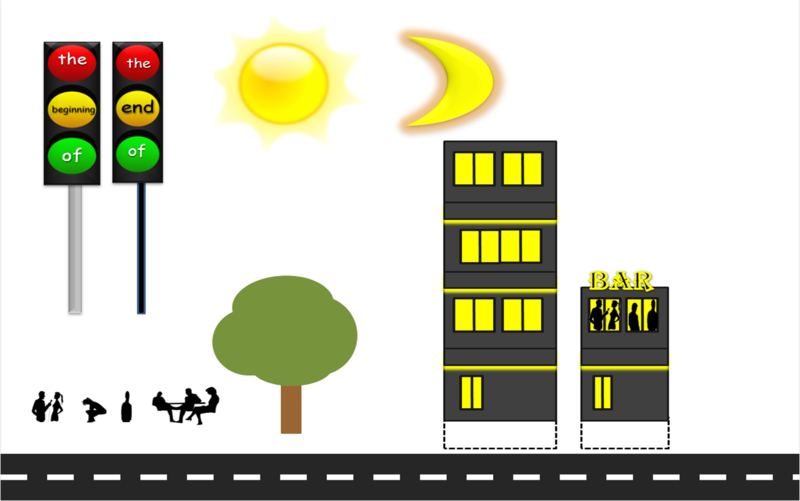 and the one on the right, where things are happening during the night. 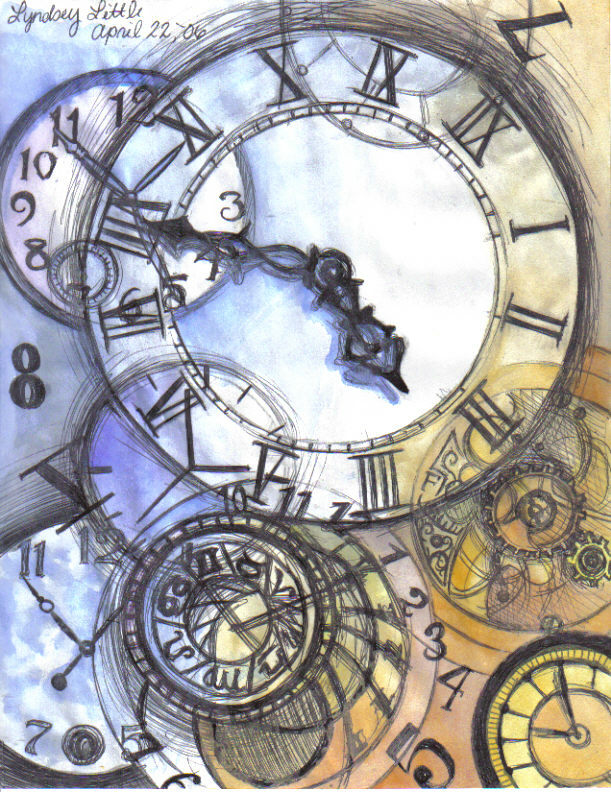 -What’s the time? -It’s 12 o’clock, right! Either at midday or at midnight. It’s up to you how to use the picture. But it would really help to print and hand it out with the following notes. Did you notice the little girl entering the school? 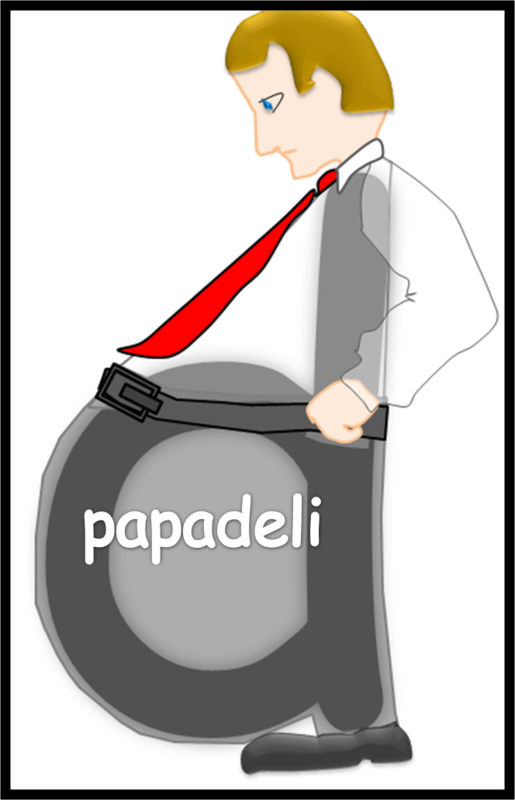 PAPADELI Language School? Did you see the red hat she is wearing? When do we wear hats like that? The little girl is at school. What is she thinking about? Maybe she needs to relax. But when can she do that? 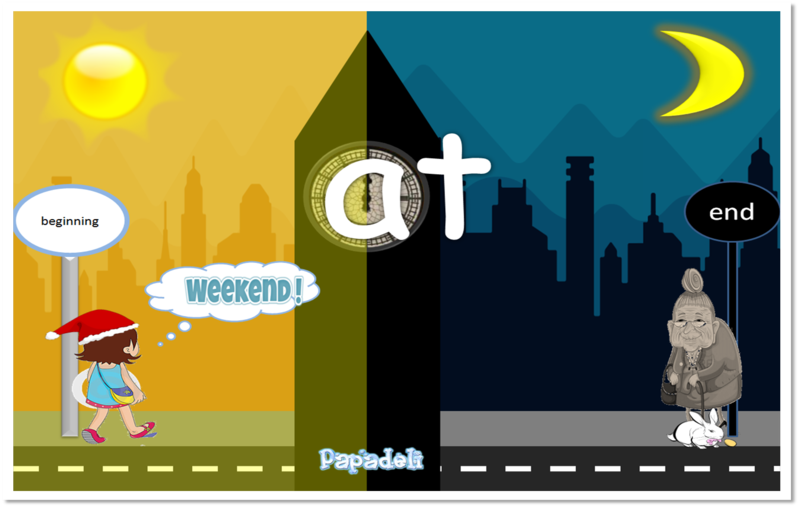 at the weekend (BrE) – *Note that in American English, on the weekend is the correct form. What about the lady at the end of the street? At her age, she shouldn’t be out at midnight. But what is she trying to do? What is this little thing with the long ears next to the egg? Oh, a rabbit. Rabbit? Eggs? What time of the year could that be? When do we decorate our home with rabbits and eggs? 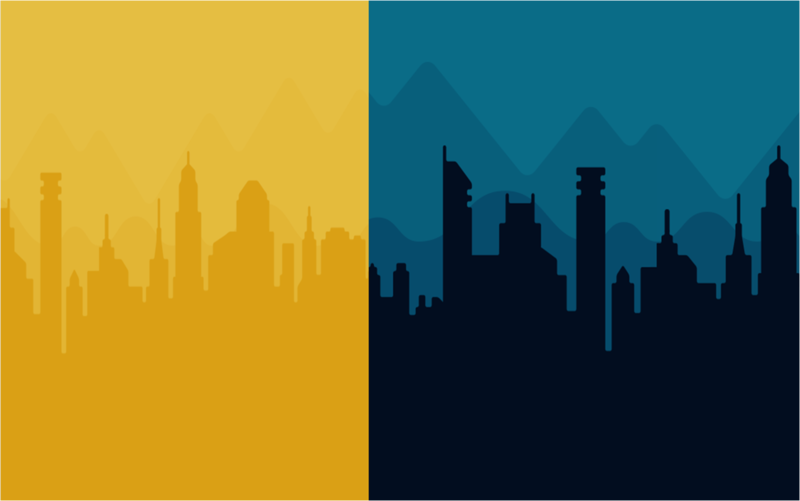 I”ve also used as a background at the back, the silhouettes of the buildings of a city, whereas at the front, the big clock. 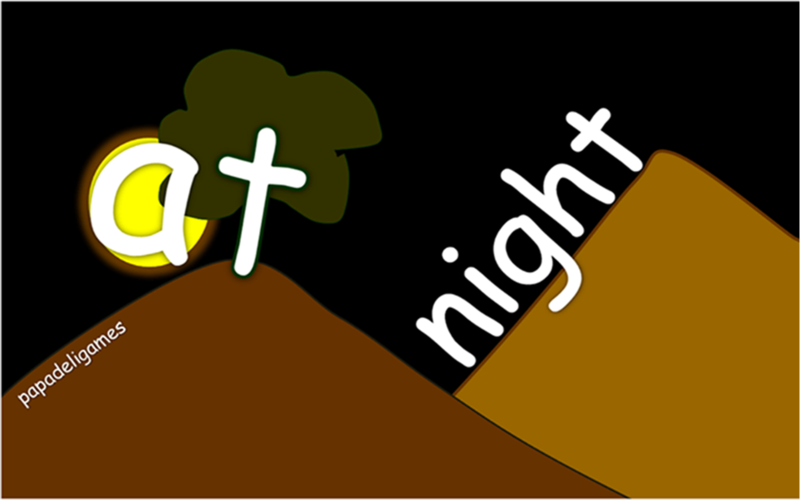 In case you present the card above, don’t forget to mention that there are 2 words, so we have 2 mountains. In this way, we prevent learners from adding a 3rd word in between. You can print the following pages and cut out the shapes. S2 follows the instructions and builds up the whole picture. 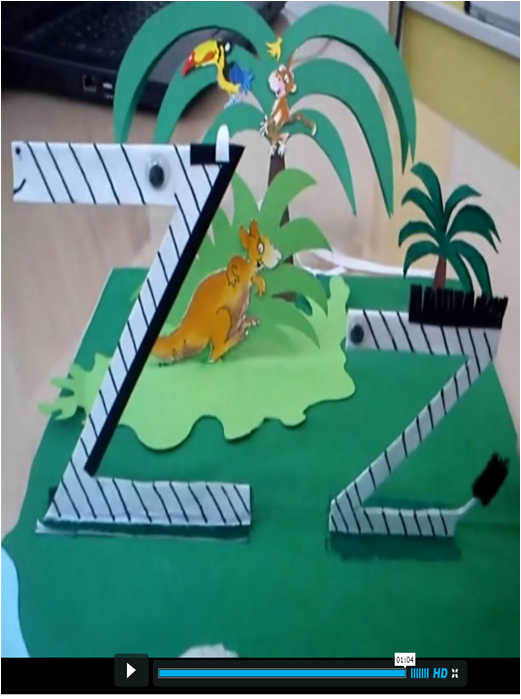 You could also create a 3D CARD, which is much more impressive! You can find a tutorial here. 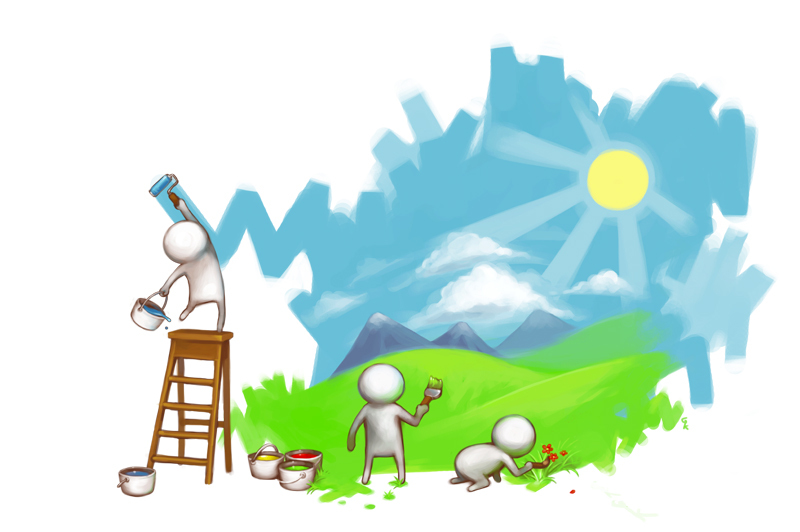 To practise writing, you can ask students to write down either the “at phrases” or the whole description of the picture. In case you choose the first option, use a stopwatch to make the activity more challenging! The winner is the one who writes the most phrases! Want more ideas? Be sure to follow me on Facebook , English Tricks 4U, Pinterest or Scoopit and sign up for emails to keep up with all the latest ideas. You might also enjoy some of my Happy New Year links. A simple ESL game 4U ! You don’t need much to get ready for this game. Just the flashcards you used to teach the new vocabulary in your last lesson. Don’t you want it in context? Get some practice with it through grammar? Well, here it is! The 1st set consists of presonal pronouns, names, animals maybe. The 2nd set consists of verbs. The ones you have just taught and want to revise. The fourth one consists of a tick (positive form), a question mark (interrogative form) and an X (negative). Each player gets 1 card from each pile. That makes it 4 cards in total. For example, “I haven’t got a pencil case”. The sentence makes sense and the player keeps the cards. 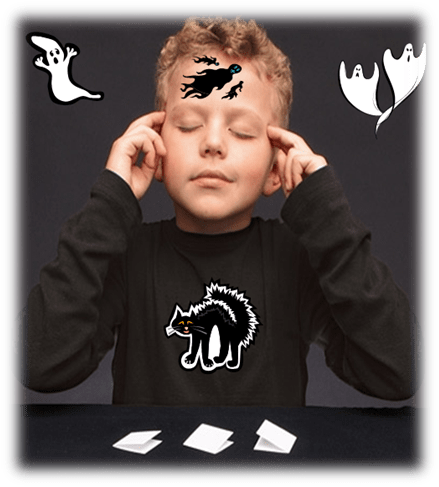 But if the sentence doesn’t make sense, the player puts the cards back. The winner is the one who gets the most cards. To sum up, this kind of flashcards is the way my Ss remember not only the meaning and spelling of the new words, but also their pronunciation. I think they are a great tool! The game I presented above is simple and doesn’t require a lot of preparation. 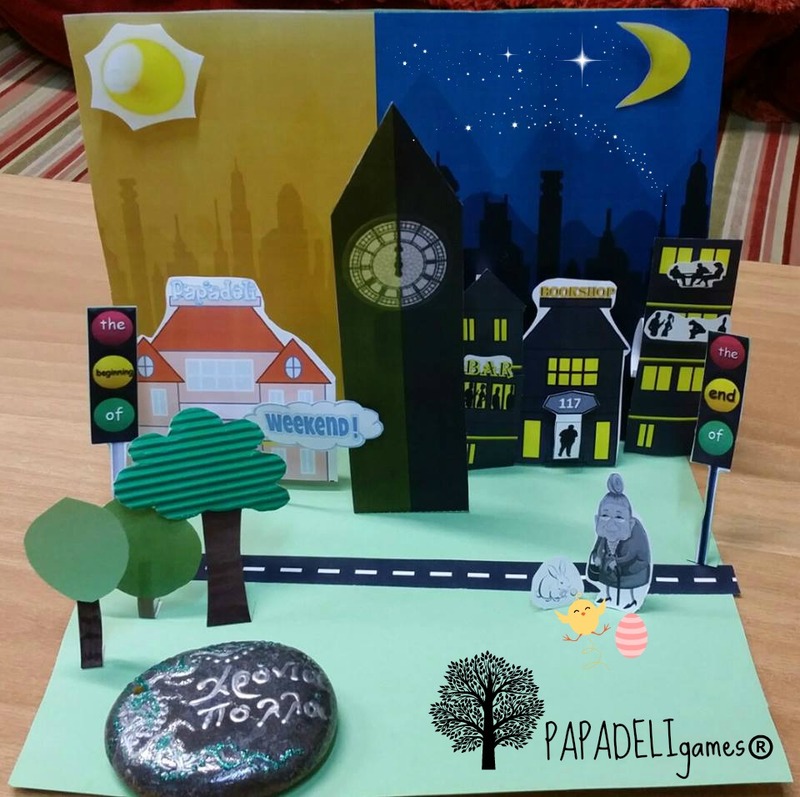 You can always use simple cards, which you prepare in 5 minutes if you don’t usually get pictures to teach. You only need a piece of paper and a pen to write the words you need. Want more ideas? 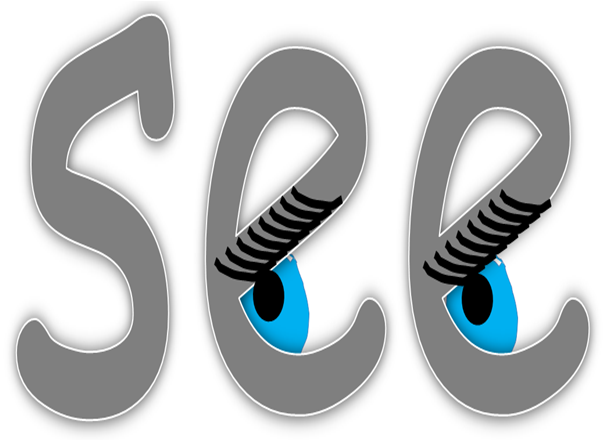 Be sure to follow us on Facebook , English Tricks 4U, Pinterest or Scoopit and sign up for emails to keep up with all the latest ideas. You might also enjoy some of our Christmas links. 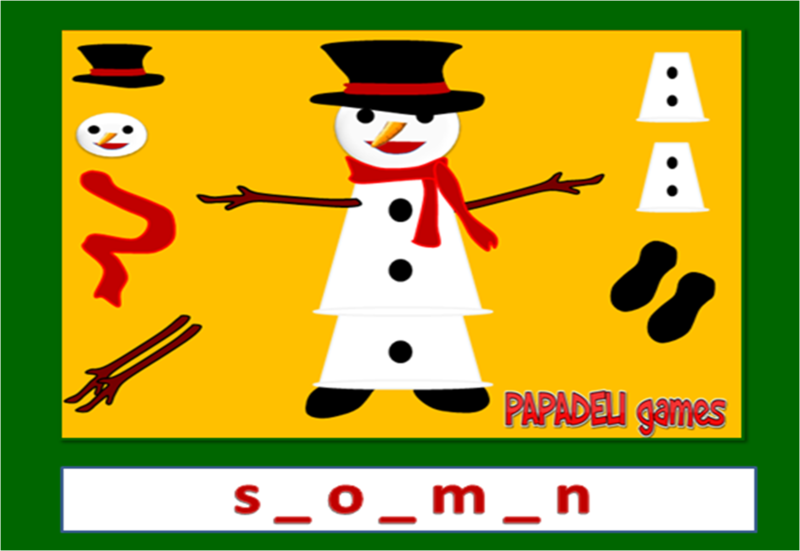 The Melting Snowman is a Christmas version of the classic game “Hangman” . 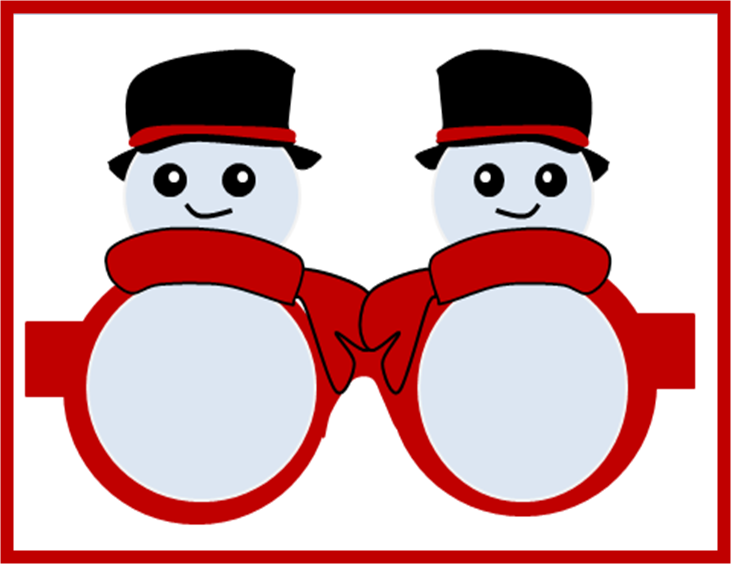 Children remove a snowman part, whenever they make a mistake, until the whole snowman has melted away! 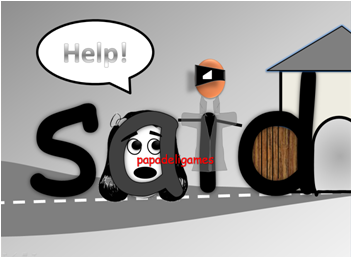 You can play it when you want to practise grammar οr vocabulary. 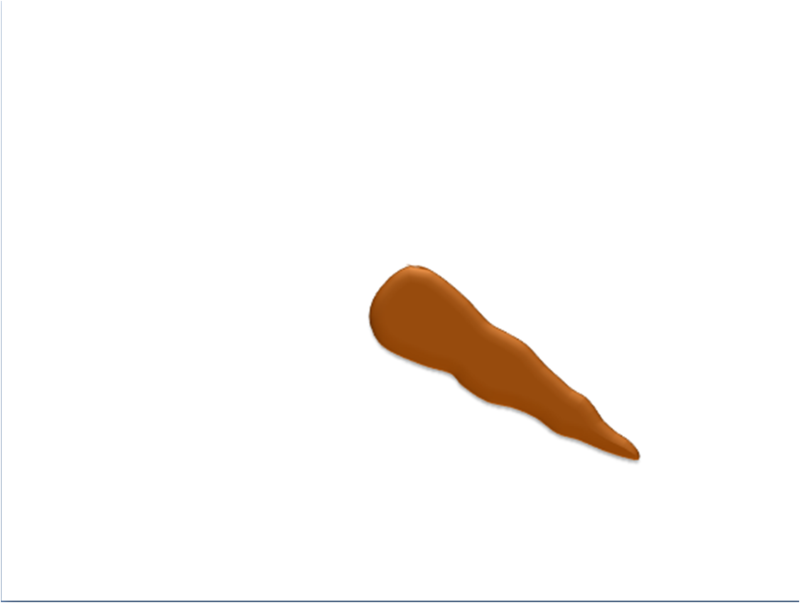 You can also use the melting snowman to practise spelling. Write down the first letter of the word you want them to spell and draw spaces for the rest. Use this link, if you want a simple printable. 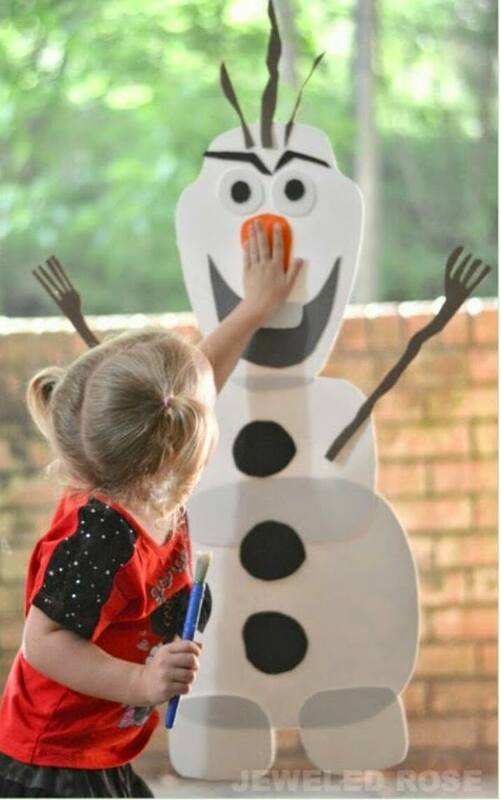 If you want to have a 3D snowman, use foam cups for the body -you can use more than two- and half a foam cup to make the head. If you don ´t like foam cups, paper plates are also great. 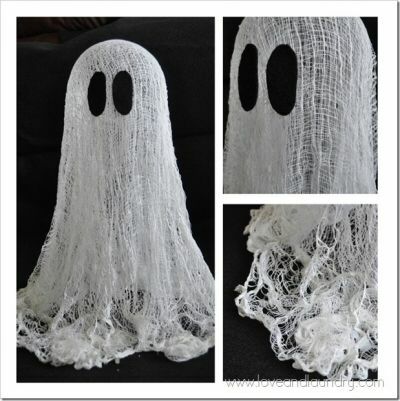 You can also use a white pompom for the head. Pipe cleaners can be used for the arms. As a hat you can use a sock. Cut the toe off and roll up the cut end. Use an orange pompom for the nose. Cut it into a carrot shape, making one side a little pointy. Make a small hole at the foam cup and stick the pompom into it. Use tissue paper for the scarf. The feet shapes can be drawn on simple paper. The eyes and buttons can be made of pipe cleaners – you could either draw them on the cups. 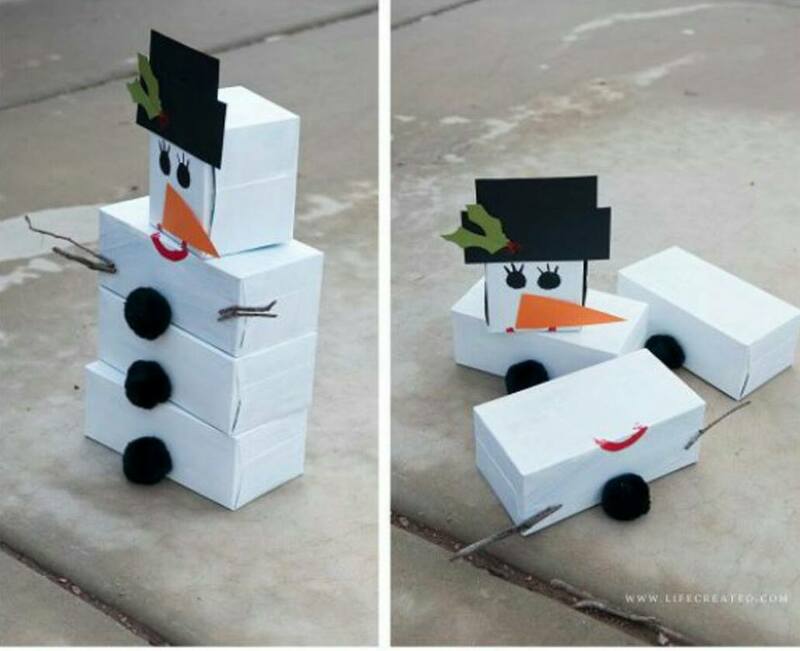 Υοu can also use boxes to make a bigger and more impressive snowman. A good idea would be to ask your students to make their own craft. 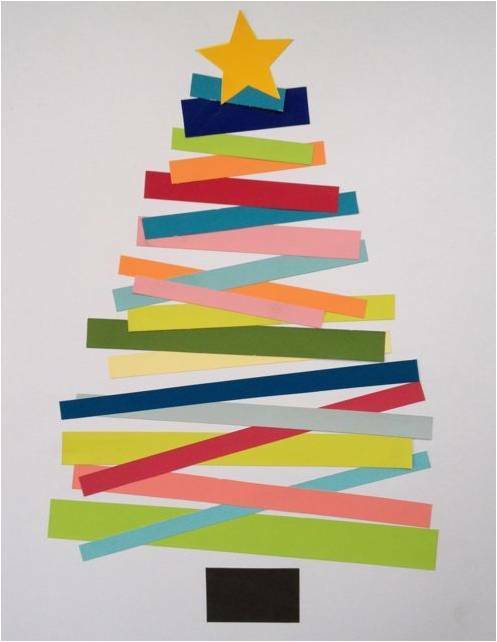 Decorate your class or room with them during Christmas. 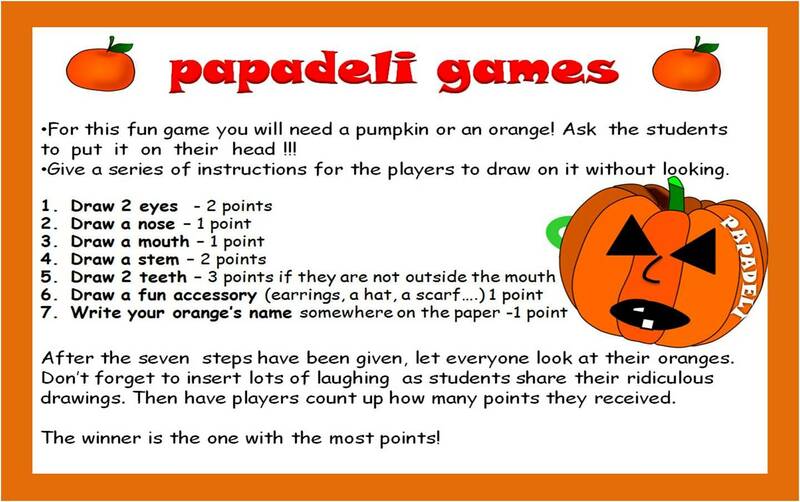 You can play this game with one player or the whole class. 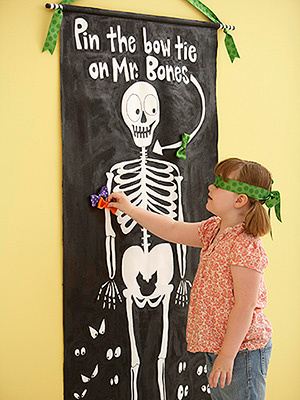 Ask children to take turns to answer your questions or find the missing letters. If you divide the class into teams, the game will be more challenging. You can revise either vocabulary or grammar. It’s simple to make it by placing stripes of paper in a row as in the picture above. Nine to ten stripes are enough. Whenever the players make a mistake you take one stripe away. 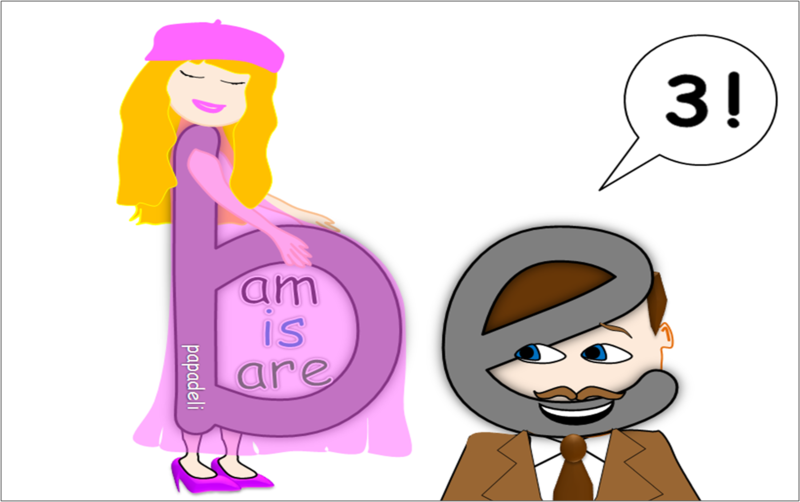 The alphabet has 26 weird symbols that 5-6 year olds have to remember. 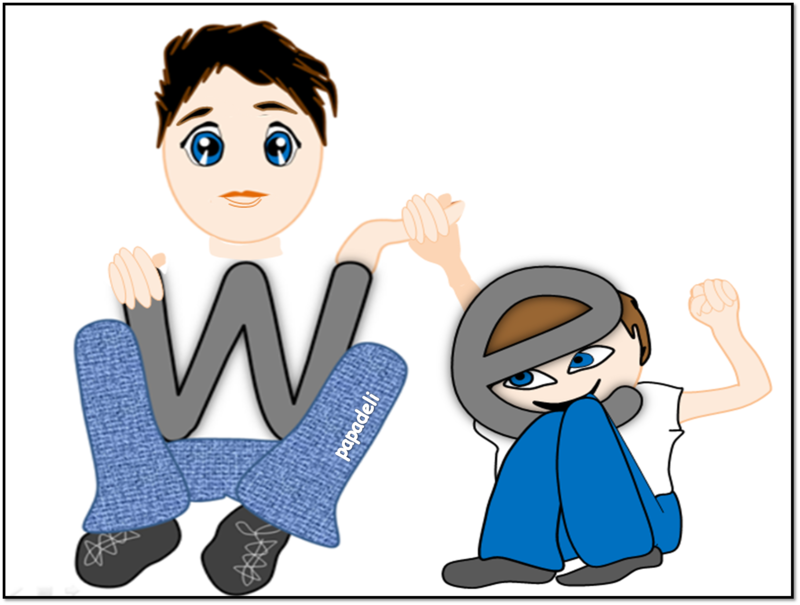 What if the letters were characters, with a life style, habits and friends? They are sociable, like meeting people and they have best friends. They usually go out with c which is a cat. 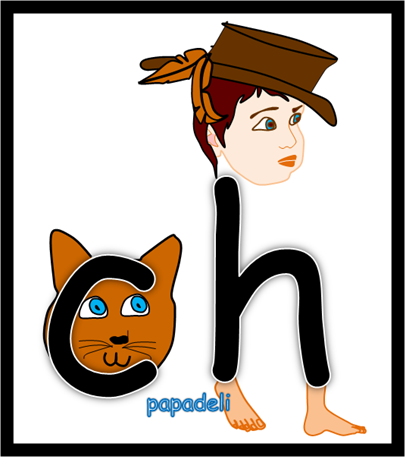 Because of the feathers you can see attached on H’s hat, the cat sneezes.. Aaaaaaa… ch!!! . There are always fancy stories behind each drawing. 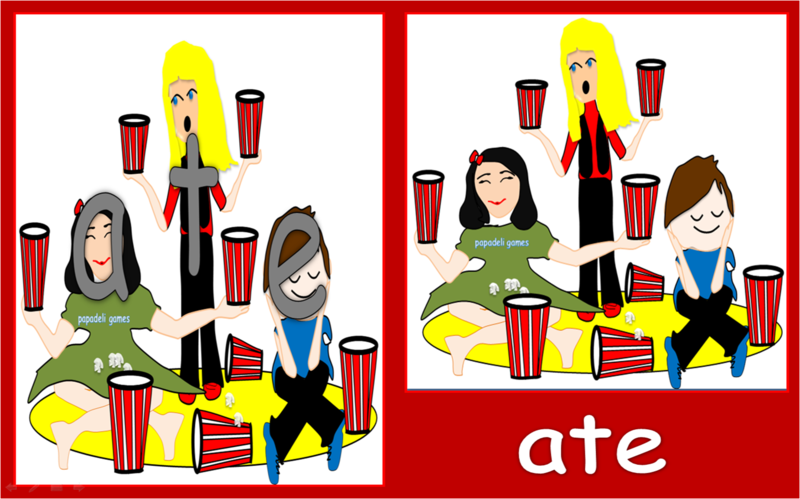 The parent or teacher uses all kind of voices, movements and talents to make them look interesting and exciting. Let me show you this serious man. Actually, he’s a dad. A great dad. Who do you think he is? 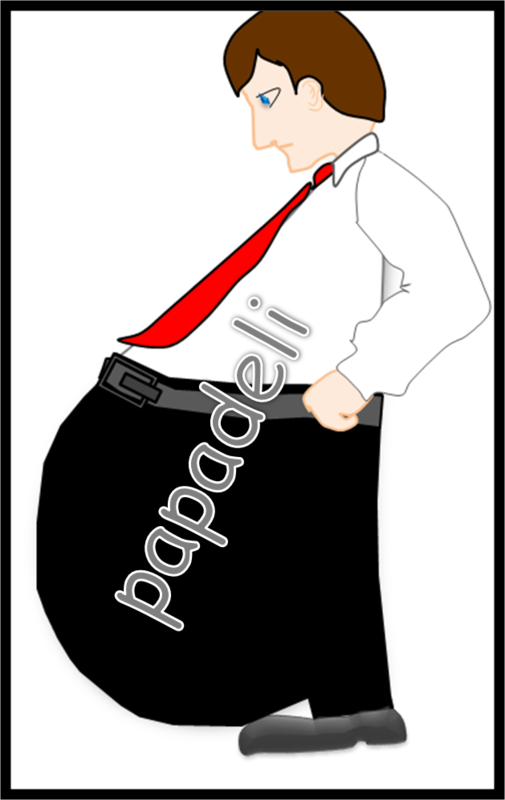 Big stomach, straight back…. Reminds you of sth? Letter d! It’s really unbelievable when you show him to the kids, dressed up, no transparent clothes and they are sure who he is! One picture is worth a thousand words…So true! But how does drawing help pronunciation? 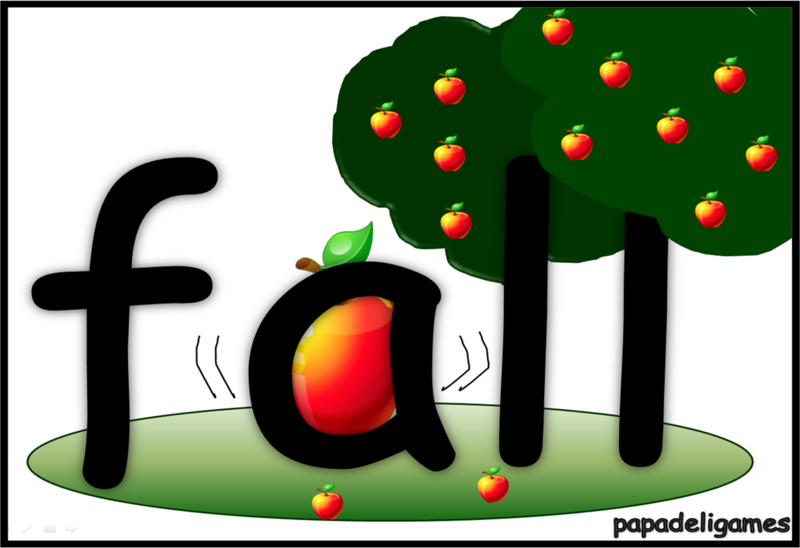 How do we pronounce ball, tall, fall? And how can we help kids remember? These two l letters are presented as apple trees. 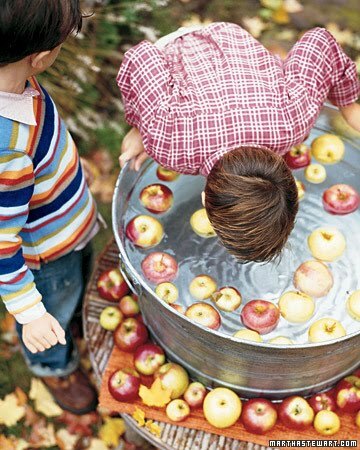 One of the apples falls and says “aw !” . 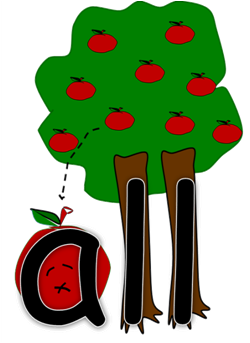 So, remember: whenever you see an apple under these two apple trees, it says “aw” because it’s disappointed. 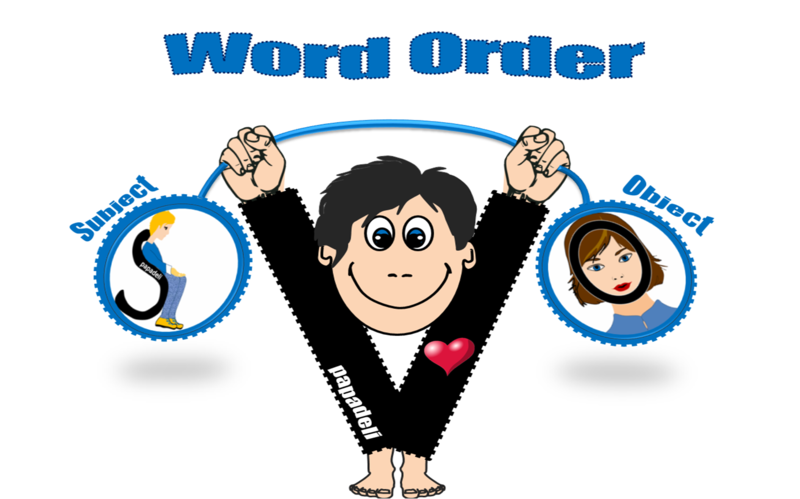 So, what about –all in words? Simple! 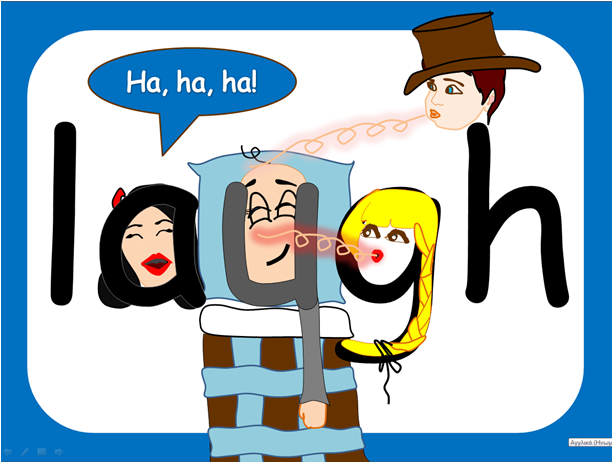 My memory tricks have helped students remember the pronunciation and spelling of a word. What about its meaning? Here’s Anne(a), the main character. 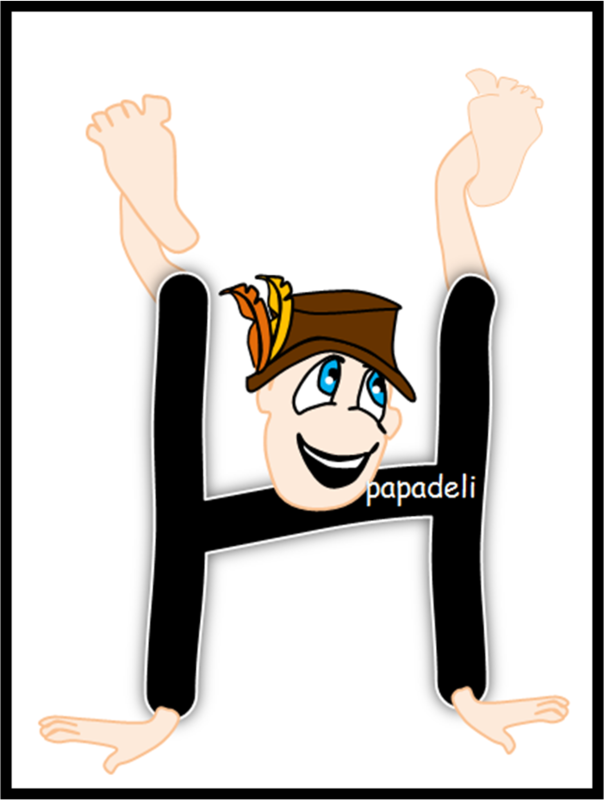 G -for girl- and H –for Hatboy. 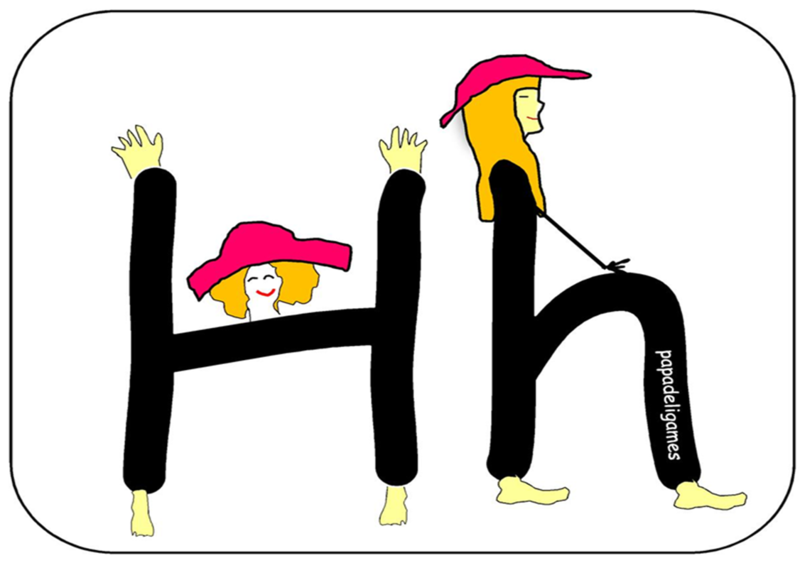 Letter g and letter h like each other. They spend time together. But they do funny things such as… blowing: ffffffffffffff Look at the baby’s hair. It’s moving. Isn’t that funny? Look at Anne. She’s laughing! In this way Ss remember meaning, spelling and pronunciation at the same time. They also have a great time. The top secret is that there are 4 stages in this procedure . 2. They have to repeat the story. We remember more when we say it. That ´s why teaching is the best way of learning. 3. They draw the story the way I do. Same characters, tricks. 4. They write the word. Then they have to find their mistakes on their own. But I have to say that they rarely make mistakes. 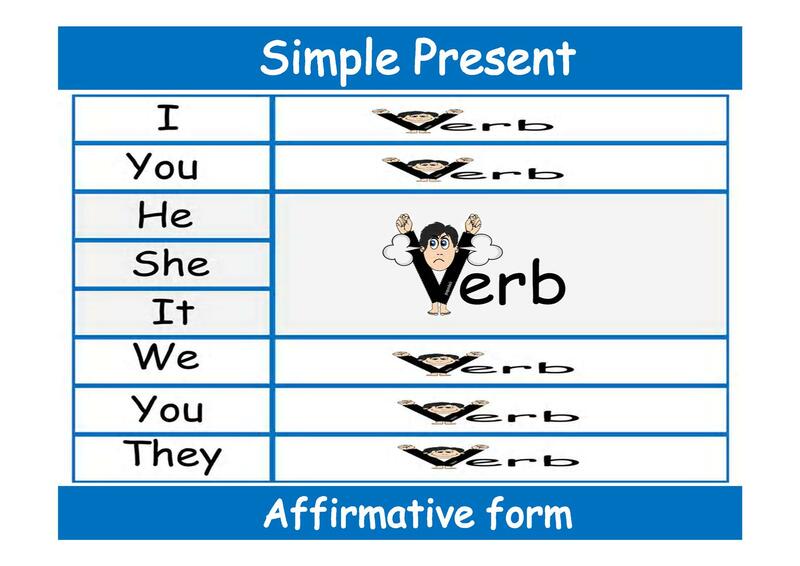 What about a verb in Simple Past? An irregular one? A is for Anne. E is for Ed. He is sleeping. He ´s not talking. That ´s why he is not pronounced. Let me finish with a drawing of my favourite story. 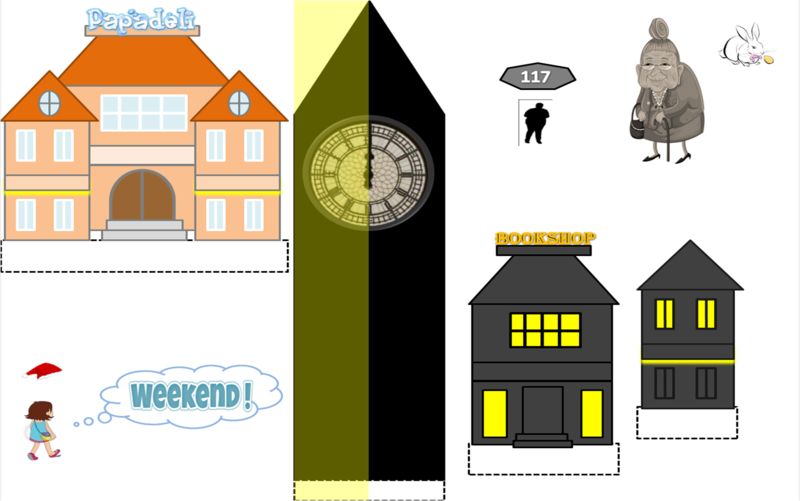 This story consists of more than 50 drawings that help me teach Simple Past. The main character is SUPERGIRL. She’s a normal student but she has super powers. One day something happened to her best friend, Anne. Remember her? 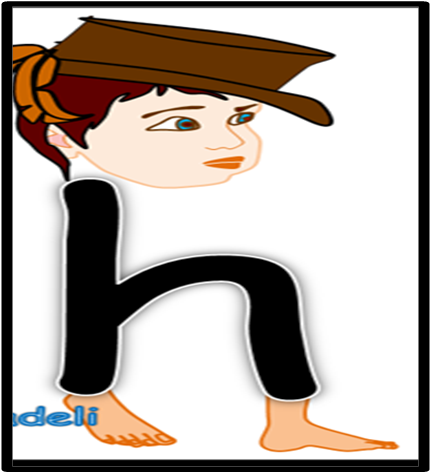 Letter a! 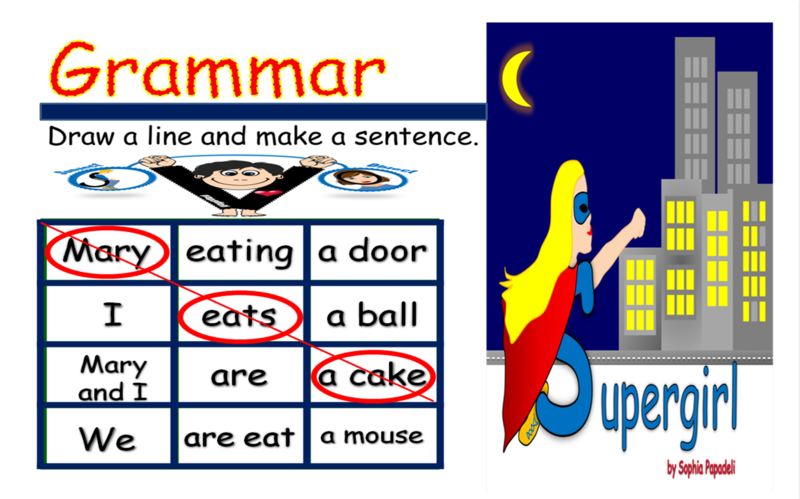 Grammar is presented by using the same tricks: drawings through words and stories. How to practise Present Continuous: This game requires 3 decks of cards: the first includes the personal pronouns. The second includes VERBS, and the third includes the symbols (.) , X, ?, which represent the affirmative, negative and interrogative form of the sentence. 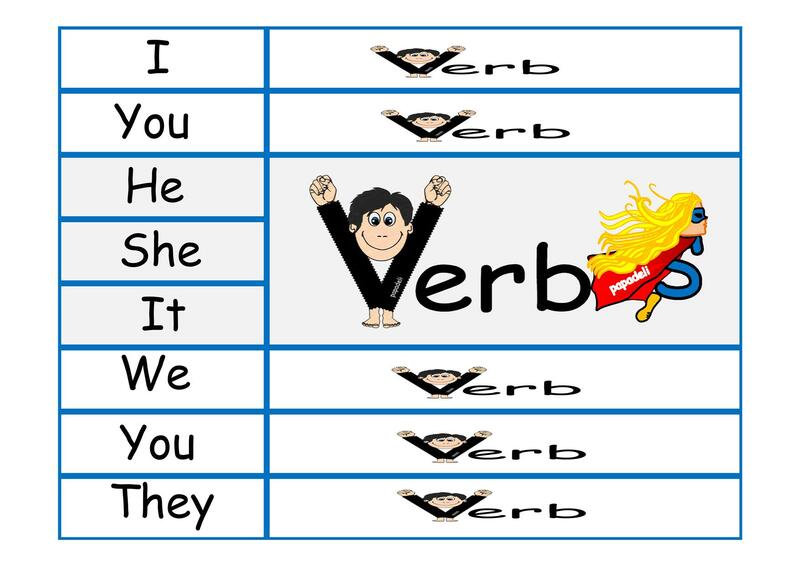 The learner must form the sentence correctly, according to the tense required, the personal pronoun and whether it’s affirmative, negative or a question. 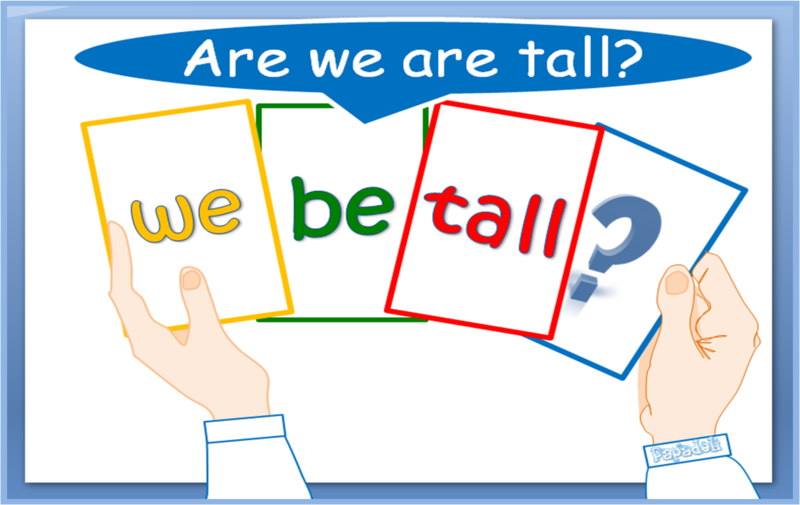 If the player forms the sentence correctly, he/she can get the verb flashcard. The winner is the person who gets the most cards. My left will make an “L”. 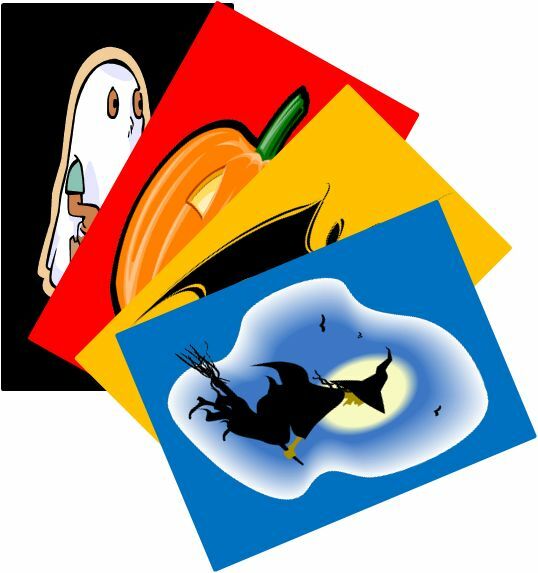 get clear and solve many problems by presenting the cards. To sum up, this is the way my Ss remember not only the meaning and spelling of the new words, but their pronunciation, as well. I think they are a great tool! Want more ideas? 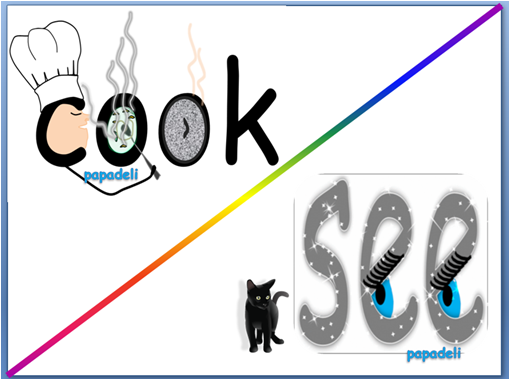 Be sure to follow us on Facebook , English Tricks 4U, Pinterest or Scoopit and sign up for emails to keep up with all the latest ideas. You might also enjoy some of our best links. 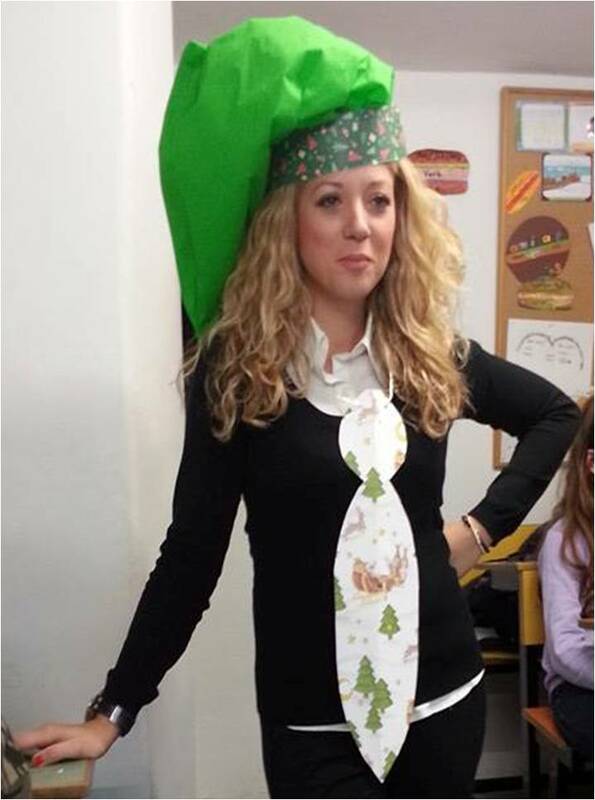 An awesome Christmas tie and an impressive elf hat. Stay at home but want to do something different? Are you having a school presentation but don’t know what the kids are going to wear and look outstanding? You are at the right place! First of all, the only thing I’m going to use is paper. We don’t have to spend a lot of money to get pretty stuff. A printer, scissors, construction paper and glue is enough. Let’s start with a huge, inpressive elf -or whatever you want to call it- hat. 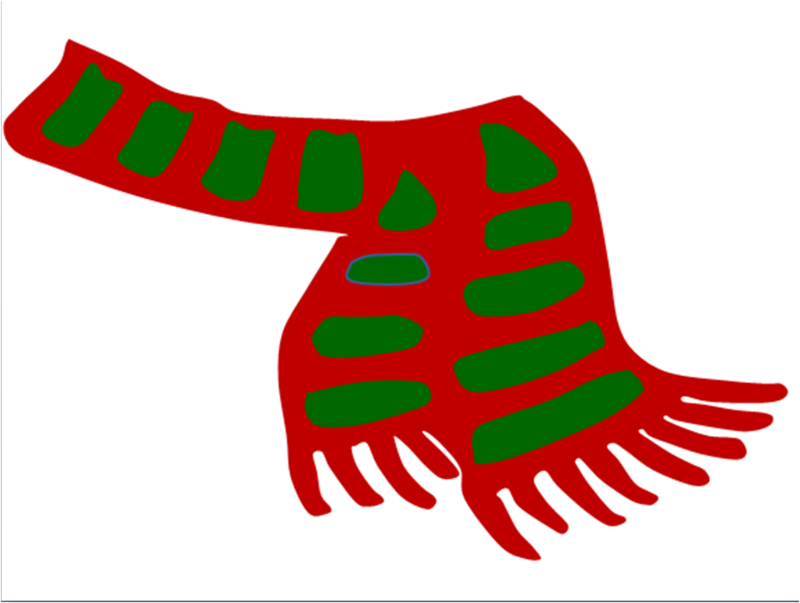 But remember: the colours of Christmas are mainly red, green and gold. 2. Once band is cut, unfold tissue paper. 3. Begin at top edge of tissue paper, and make pleats (about 5 at a time). 5. Next you need to pleat the opposite end of the tissue paper (taping the pleats together by themselves, not to band). 6. After the pleats are finished, overlap band and tape closed. 7. Fold tissue paper in half, so the unattached edge can be taped to inside of band. 8. You will need to pull the unattached edge inside the band and tape it along the band… it is ok if there are gaps open on each end – just do not overlap the pleats at the sides. 9. At each side, pleat and gather tissue from bottom of open end to the other bottom open end. Pinch the pleats together to create a little pleated tuck and pull inside the hat band. 10. Once the pleated tuck is pulled inside, tape it to the hat band so it closes the hat side. Repeat on opposite side. *Note, it helps to insert your hand underneath/inside the hat to gently fluff the tissue so it rounds out, while doing this step. You kind of need to fluff it into place. It’s really impressive! Huge but comfortable. 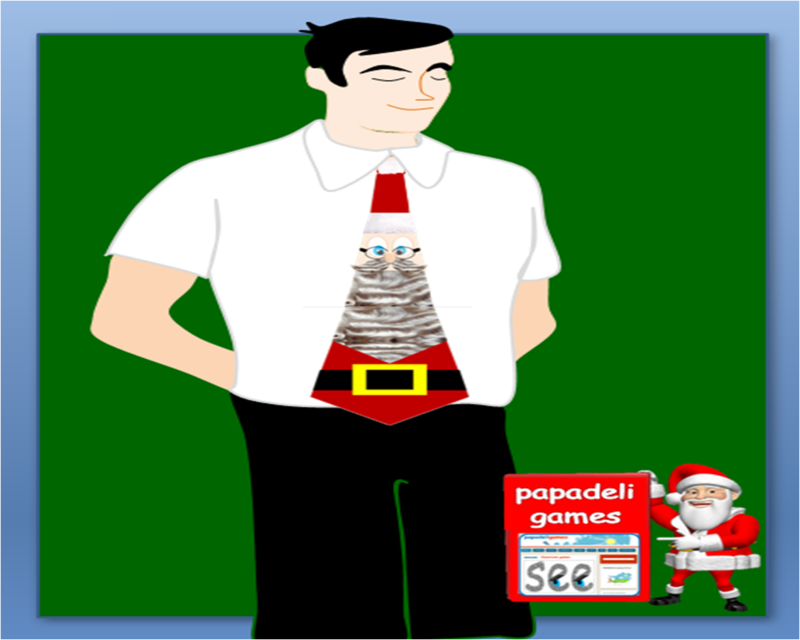 What about a Christmas tie? There’s no work here. You just print and adjust the pieces. You can see that all parts have been drawn by me. You can change whatever you want and adjust to the child or lucky adult who is going to wear it. I’ll post pictures of kids wearing the hats and ties as soon as the rehearsals of our presentations start. For the time being, I’ll give one more idea. 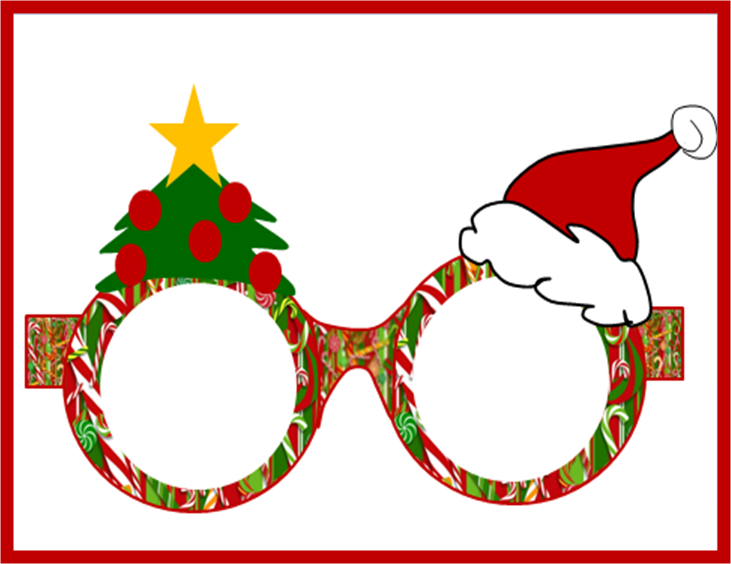 What about Chistmas glasses? Wouldn’t that be fun? 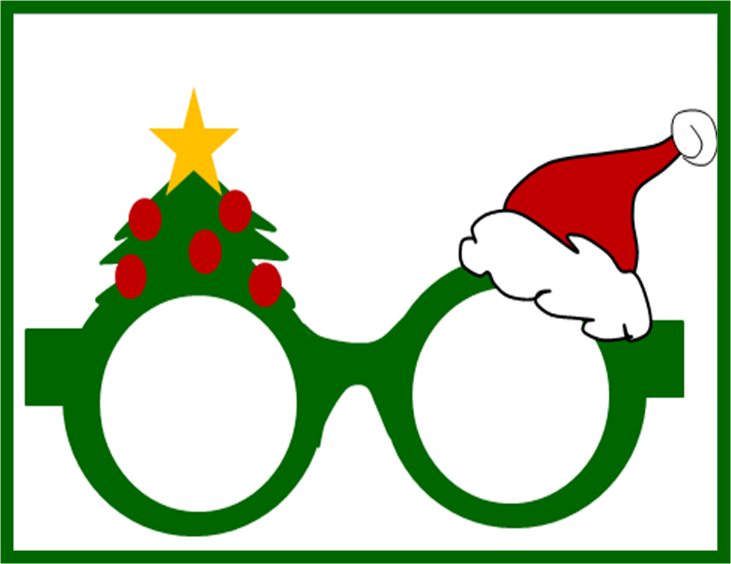 You can download the drawings of my glasses here. Don’t hesitate to send me pictures of you or your children wearing them in case you want me to post them. 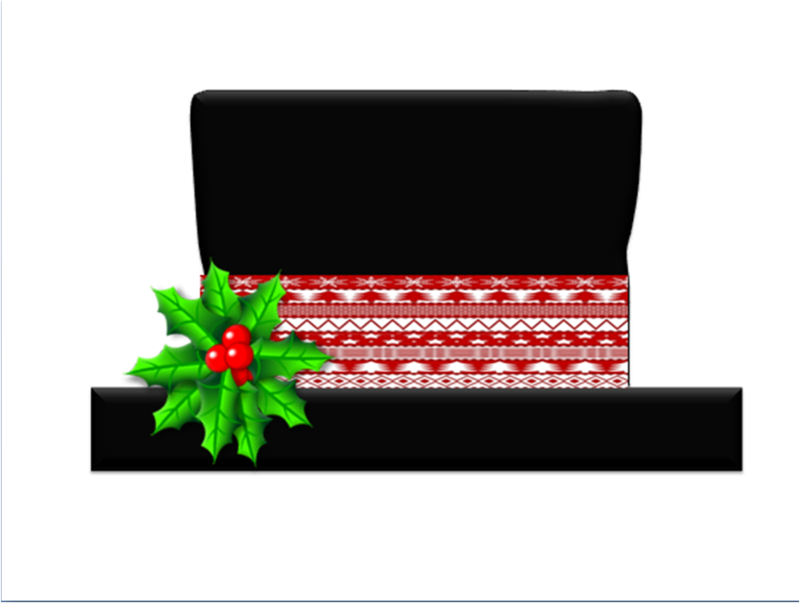 The hat, tie and glasses could also be used as clever gift wrapping ideas. 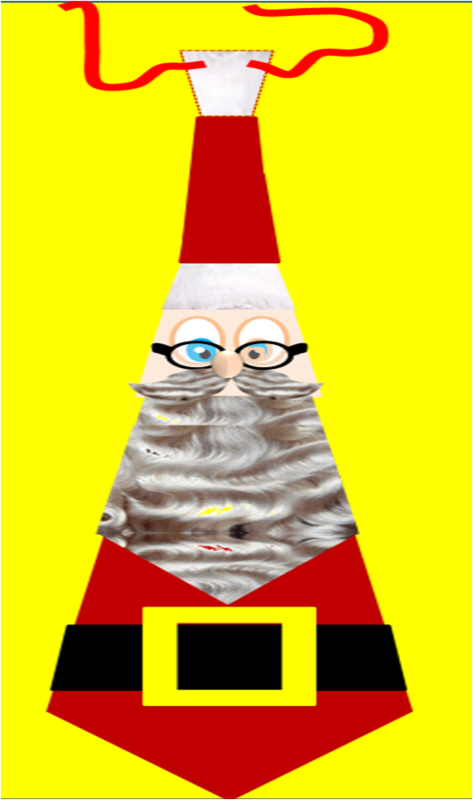 Make a Santa Claus and trim his beard until you get to christmas! Another one? Be sure to follow us on Facebook , Pinterest or Scoopit and sign up for emails to keep up with all the latest ideas. You might also enjoy some of our best links. 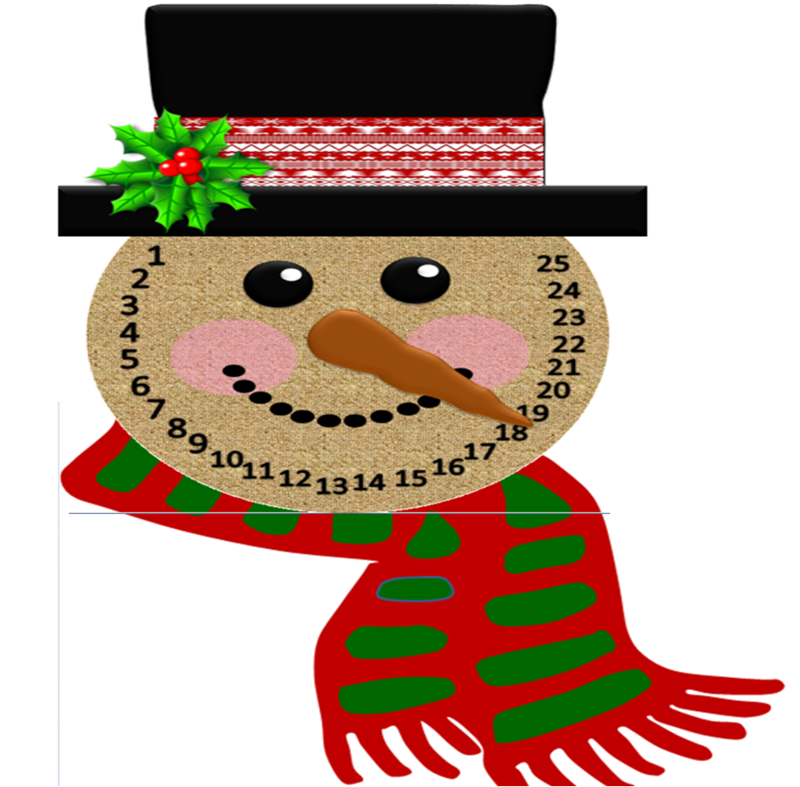 I came across this idea for the Snowman Christmas Countdown and thought: Why not make a kid-friendly version printable? So, here it is! 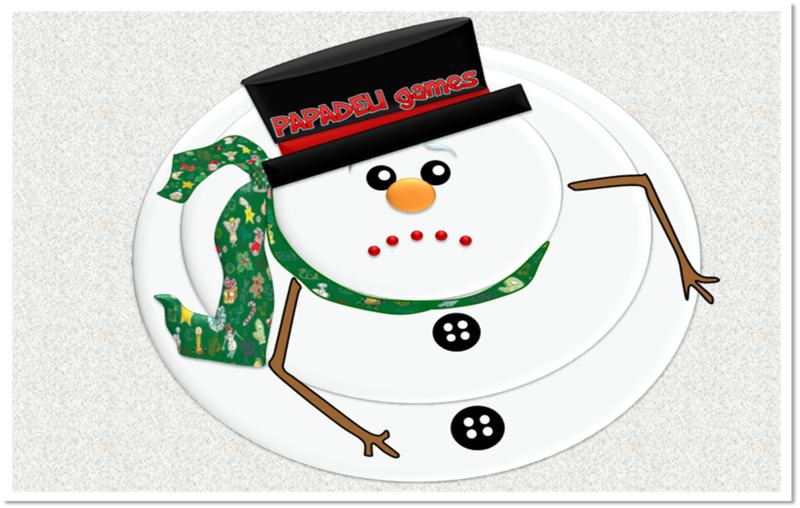 First, you have to print and cut out all the pieces for the snowman. 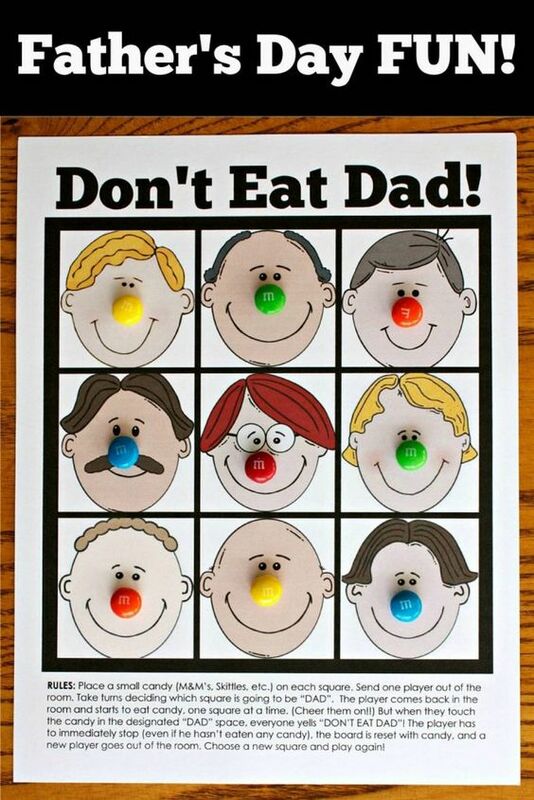 The printable includes a top hat, a face, a nose and a scarf. It’s better to stick them all onto construction paper .You could also decorate the hat with buttons, feathers, and Christmas leaves. Then, you can assemble the snowman by gluing the hat onto the face and attaching the nose with a brad. 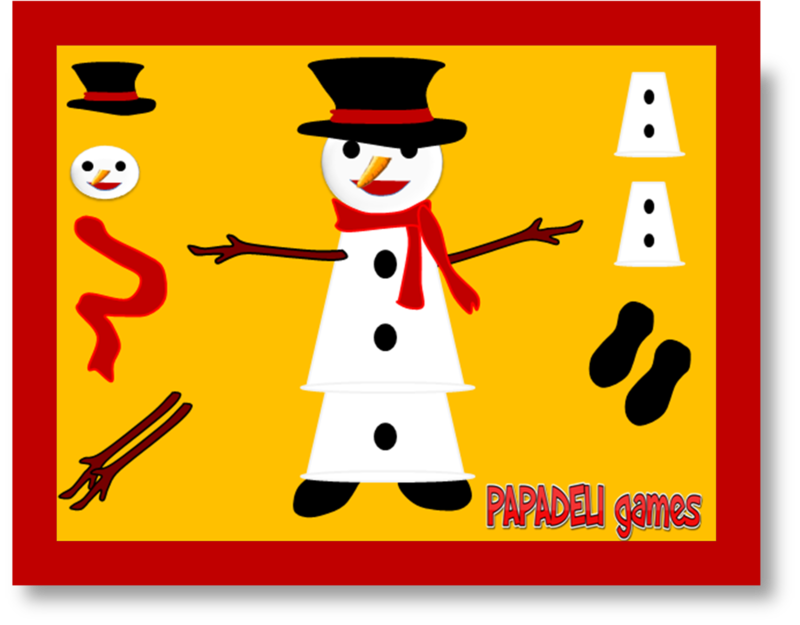 If you want to extend the idea, you could draw the body of the snowman. Two big white circles of paper will do. Want more ideas? Be sure to follow us on Facebook , Pinterest or Scoopit and sign up for emails to keep up with all the latest ideas. You might also enjoy some of our best links. To Χάλοουϊν (Halloween) είναι γιορτή του δυτικού κόσμου που γιορτάζεται την νύχτα της 31ης Οκτωβρίου, κατά την οποία τα μικρά παιδιά μεταμφιέζονται, κατά κανόνα σε κάτι “τρομαχτικό” και επισκέπτονται σπίτια μαζεύοντας γλυκά, ενέργεια γνωστή ως “trick or treat” (σκανταλιά ή κέρασμα). Η γιορτή αυτή μοιάζει με τις Απόκριες, όμως διαφέρει από αυτές καθώς το Halloween έχει περισσότερο μυστικιστική χροιά. αυτής είναι τα φαναράκια φτιαγμένα από πραγματικές κολοκύθες πάνω στις οποίες υπάρχουν χαραγμένα ανθρώπινα χαρακτηριστικά, άλλοτε πιο χιουμοριστικά και άλλοτε πιο τρομαχτικά. Από την αρχαία αυτή παράδοση προέρχεται μια από τις πιο διάσημες εικόνες της γιορτής: το φανάρι από κολοκύθα (Jack-o-lantern). Προέρχεται από ιρλανδικές παραδόσεις και η χρήση του ήταν να φωτίζει τη χαμένη ψυχή του Jack, ενός διαβόητου απατεώνα που είχε κολλήσει ανάμεσα στους δυο κόσμους. Λέγεται ότι ο Jack είχε ξεγελάσει το διάβολο και τον έπεισε να μπει στην κουφάλα ενός δέντρου και σκαλίζοντας την εικόνα ενός σταυρού στον κορμό του δέντρου τον παγίδευσε εκεί μέσα. Οι φάρσες του είχαν ως αποτέλεσμα να του αρνηθούν την είσοδο στον Παράδεισο και καθώς είχε νευριάσει επίσης τον Διάβολο που κυβερνούσε την Κόλαση, ο Jack απέμεινε μια χαμένη ψυχή παγιδευμένη ανάμεσα στους κόσμους. Ως παρηγοριά, ο Διάβολος του έδωσε λίγη χόβολη για να φωτίζει το δρόμο του στα σκοτάδια μεταξύ των δυο κόσμων. Αρχικά στην Ιρλανδία έπαιρναν ρέβες και τις έσκαβαν βάζοντας στο εσωτερικό τους ένα κερί για να τις χρησιμοποιήσουν ως φανάρια, ώστε να βοηθήσουν να οδηγηθεί το χαμένο πνεύμα του Jack πίσω στο σπίτι του. 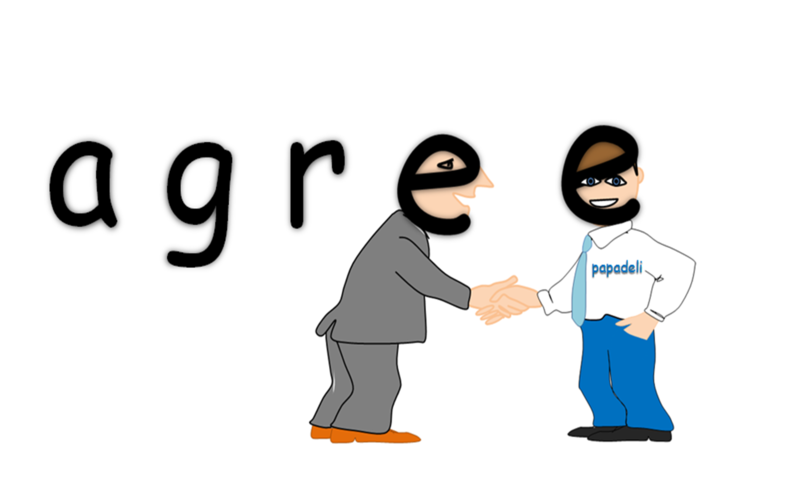 Κι έτσι προέκυψε η ονομασία, Φανάρια του Jack. Αργότερα, όταν ήρθαν μετανάστες στο Νέο Κόσμο οι κολοκύθες ήταν πιο εύκολο να βρεθούν κι έτσι σκάλιζαν αυτές και έβαζαν μέσα κεριά για να τις κάνουν φανάρια. Κάντε κλικ στις παρακάτω δραστηριότητες για να νιώσετε το πνεύμα του Halloween. Hangman : Ξέρεις τις λέξεις; Παίξε κρεμάλα. Kαταπλήξτε το κοινό σας με αυτό το τρικ! Γράψτο σε ένα από τα 3 χαρτάκια και χωρίς να αφήσεις κανέναν να δει τι έγραψες, δίπλωσε το χαρτί και ζήτα από αυτόν που το σκέφτηκε να το πει δυνατά. Συνέχισε τη διαδικασία με έναν αριθμό— ένας από ατο κοινό σου σκέφτεται, εσύ γράφεις, αυτός που το σκέφτηκε λέει δυνατά τον αριθμό— και τελικά με ένα χρώμα, λέγοντας στον παίχτη να διαλέξει ένα από τα δύο χρώματα: πράσινο ή κόκκινο. Τώρα δώσε τα 3 χαρτάκια σε έναν από το κοινό σου για να τα διαβάσει φωναχτά. Οι φίλοι σου θα εντυπωσιαστούν από τις υπερφυσικές δυνάμεις σου! Draw a simple web on a large piece of paper. Create black spiders on small pieces of paper with a tape pillow attached to the back. Blindfold the children trying to “pin” their spiders on the web. 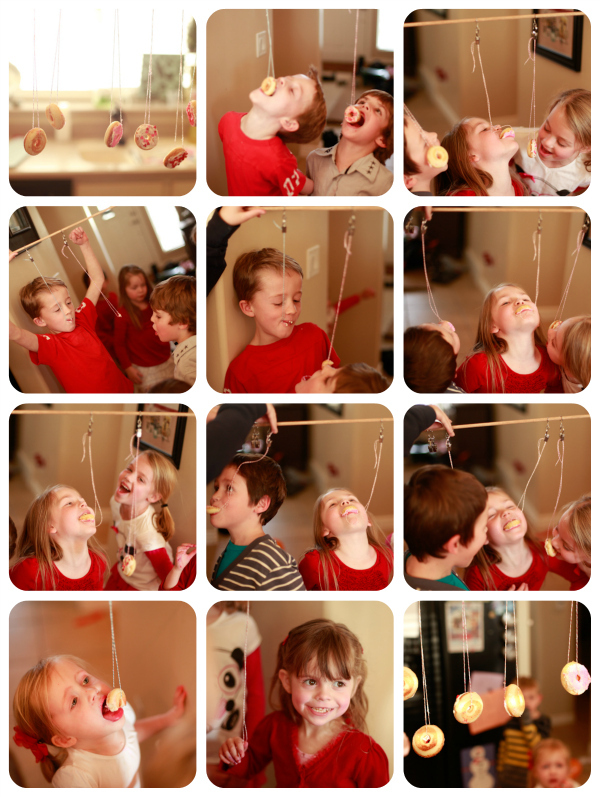 Using a spider web for young children gives them many opportunities for success because there is not an exact place the spider has to be pinned. 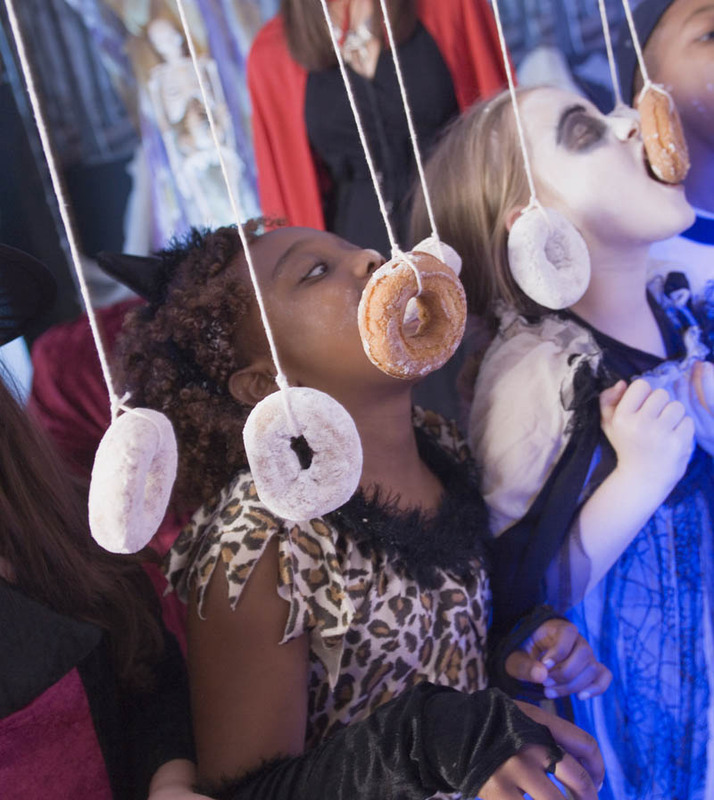 Are you throwing a Halloween party this year? 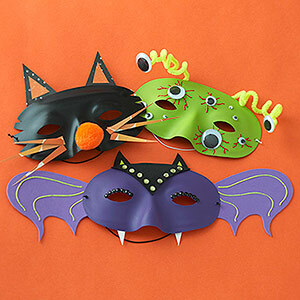 The Home and Garden Cafe has made it simple for you to get started with this list of 10 easy Halloween craft ideas that are sure to please the kids and the adults! 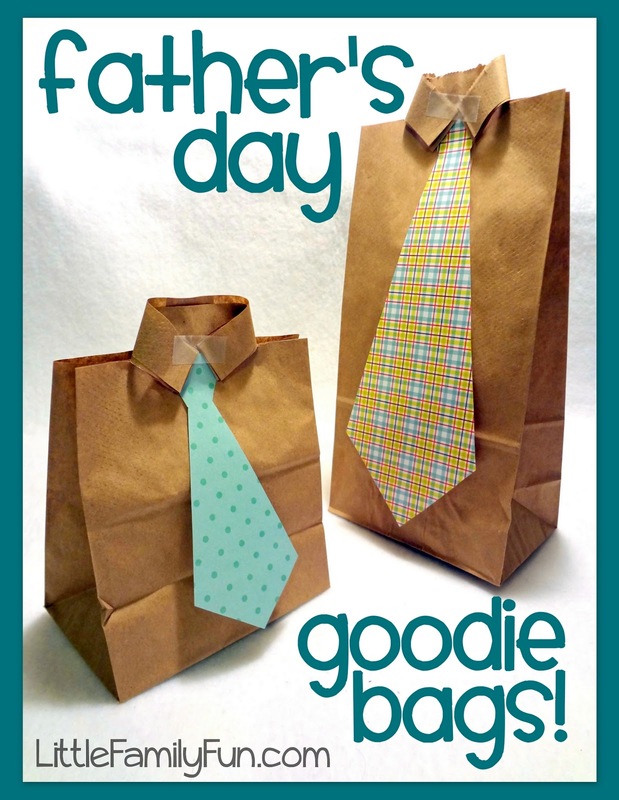 “Father”, “Dad”, “Papa”, “Daddy”… Treat your dad like a superhero ! 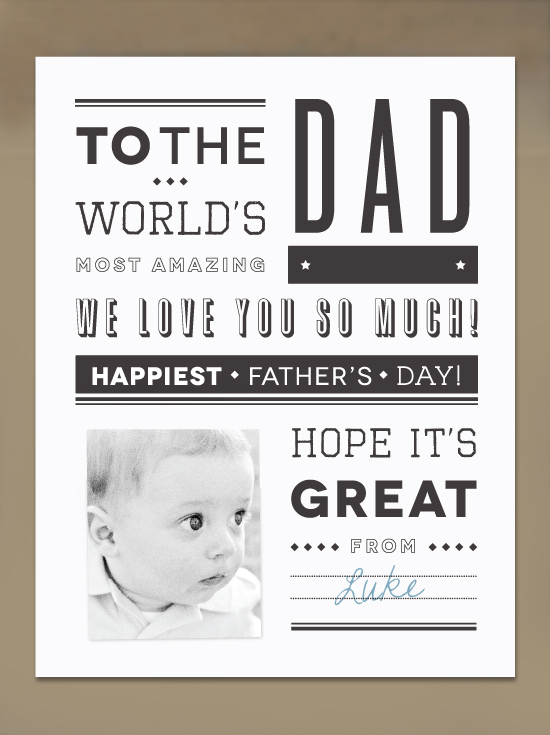 Superhero Dad Gift Free Printable Sign for Father’s Day! 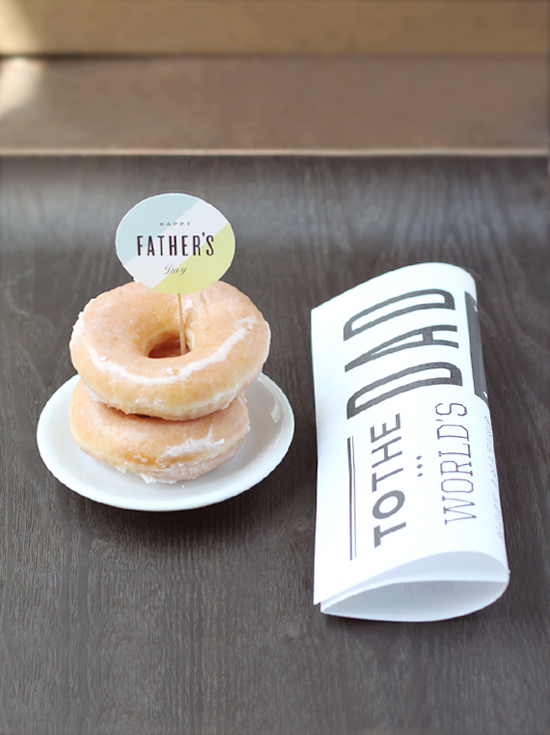 Special paper details on the breakfast table are the perfect way to surprise your dad. 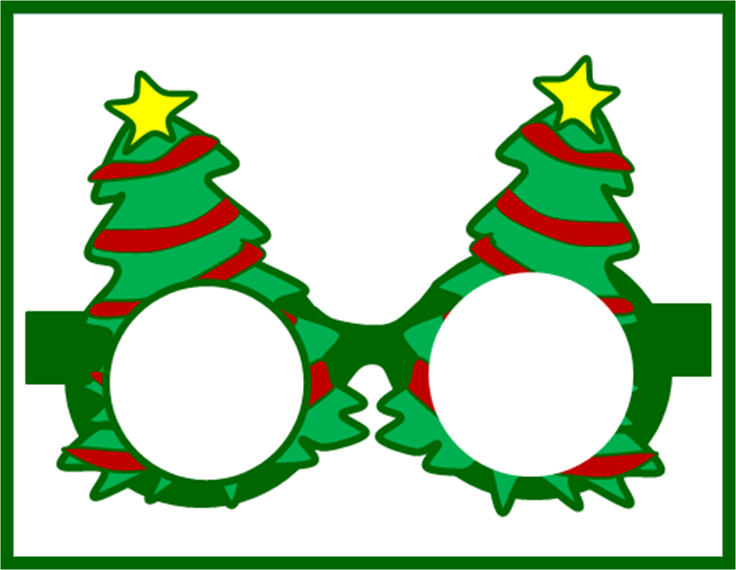 Make and wear these glasses ! Μy father didn’t tell me how to live; he lived and let me watch him do it ! 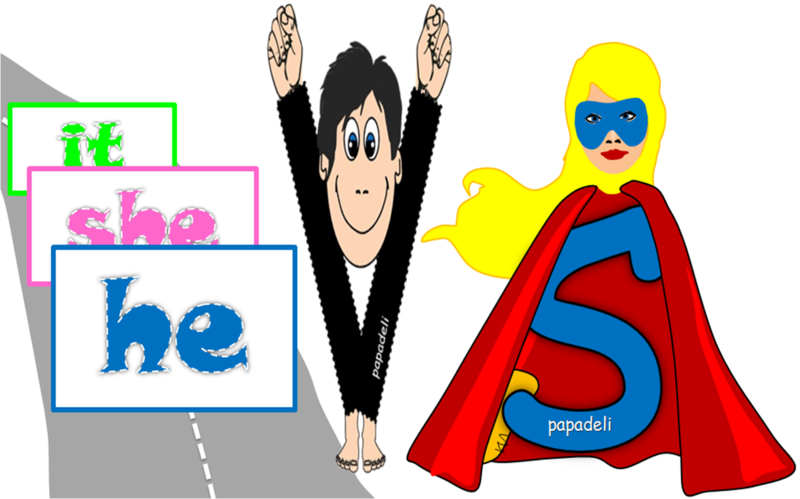 Daddies Are Special People – Music with Mar. “Valentine’s Day Facts of Love” infographic. Love note in a bottle. 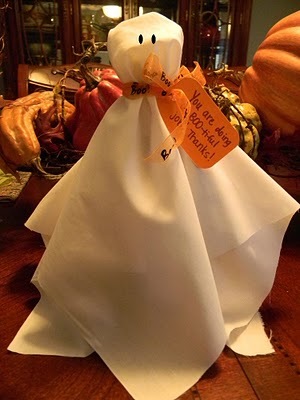 Makes a great teacher or friend gift. 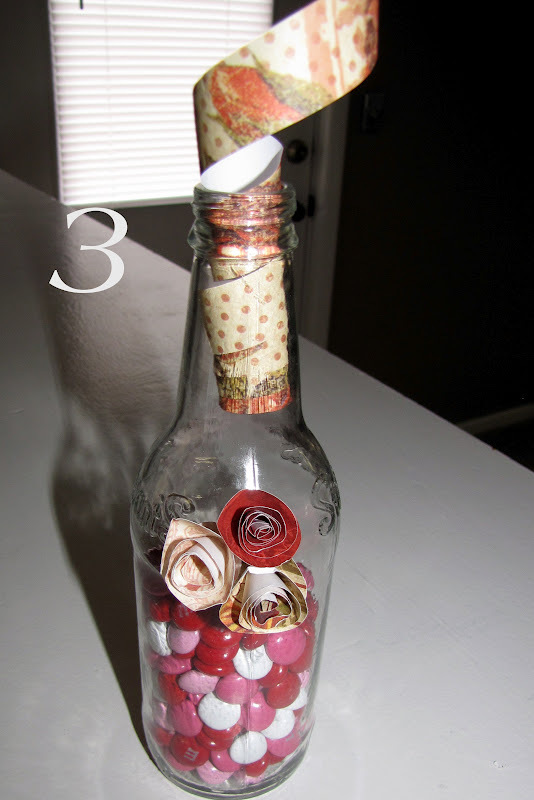 Fill a washed out glass soda bottle with candy of your choice, then cut a long strip of fancy paper and have your child or you write what they love about the person receiving the gift. Roll the paper up like a message in a bottle and cap it. 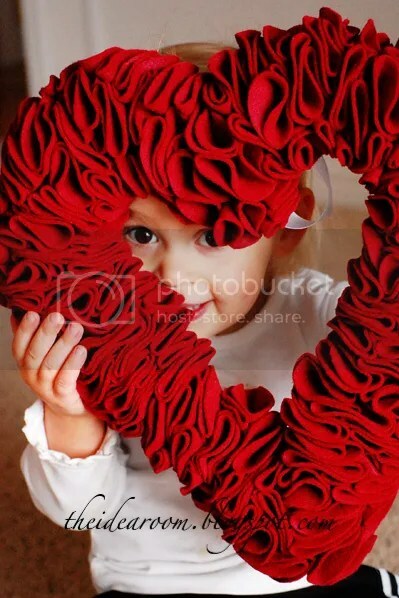 Add some paper flowers and there you have a super cute, fast gift. 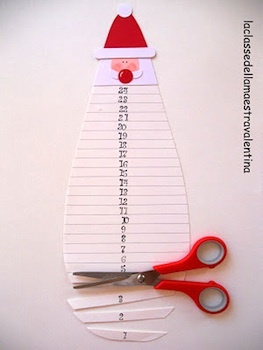 Here ´s another great idea! It is a pencil bouquet. On the inside are regular pencils with a layer of Valentine ´s pencils on the outside. 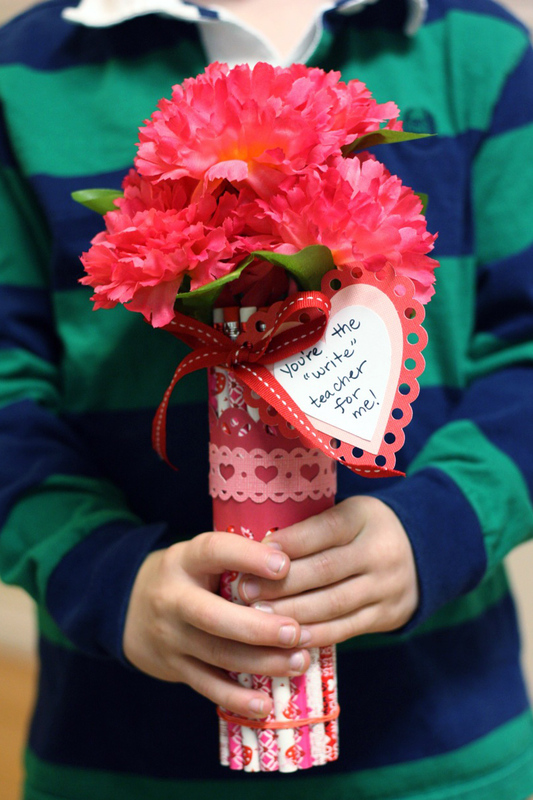 Tie a nice red ribbon around them with a heart-shaped note that says, “You ´re the ´write ´ teacher for me!”. Then put some nice fake flowers on the top to finish the bouquet. The best site I’ve ever used!